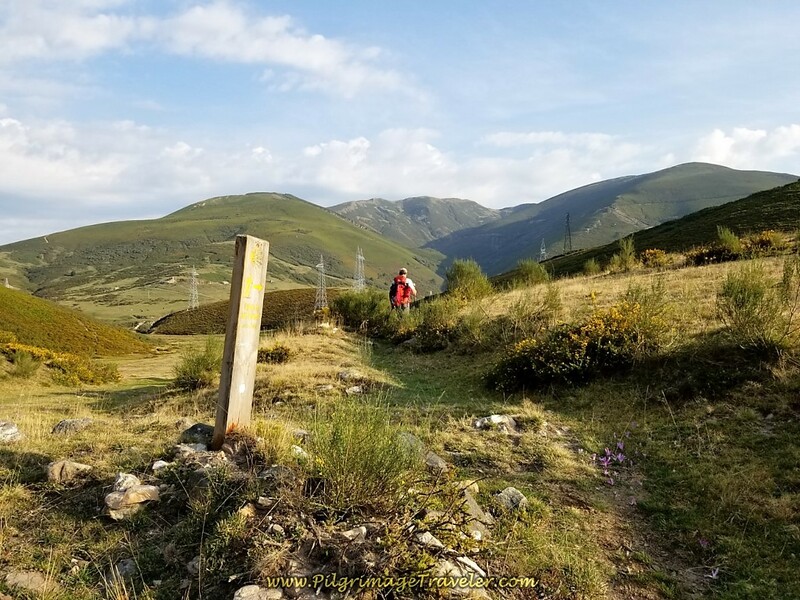 Day three on the Camino de San Salvador was a stunning climb out of Poladura to the Cross of San Salvador and the highpoint, the Canto la Tusa, and a gorgeous walk over the Puerto de Pajares at 1378 meters. 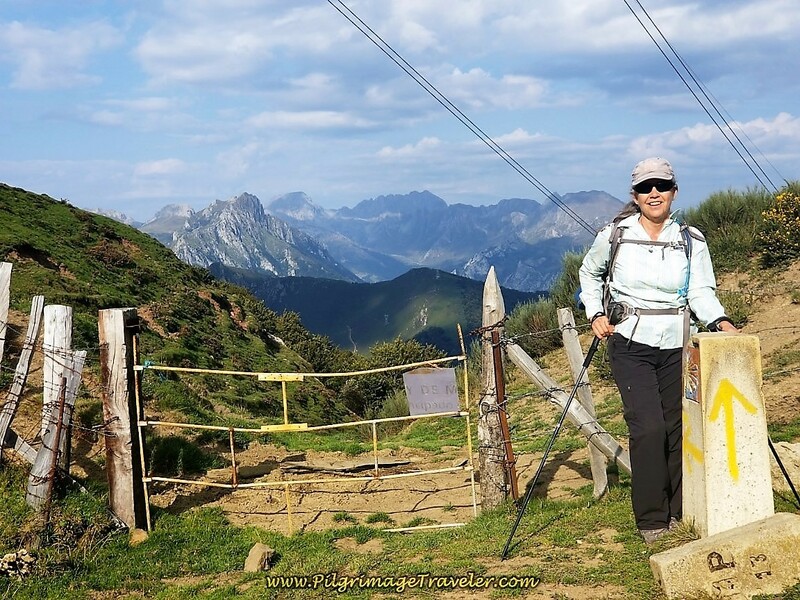 The views of the mountains are nothing less than than fabulous! While this article covers only 14.1 kilometers to Pajares, we did not walk there, but instead went onward, a full 30. 4 kilometers to Campomanes. The second half of our day is covered in our article on day four. I broke our stage up into two parts for the purpose of this guide, as I would not recommend doing this entire way in one day. Believe me, there is a reason why the 3rd stage on the San Salvador is a short one and ends in Pajares. We learned the hard way. 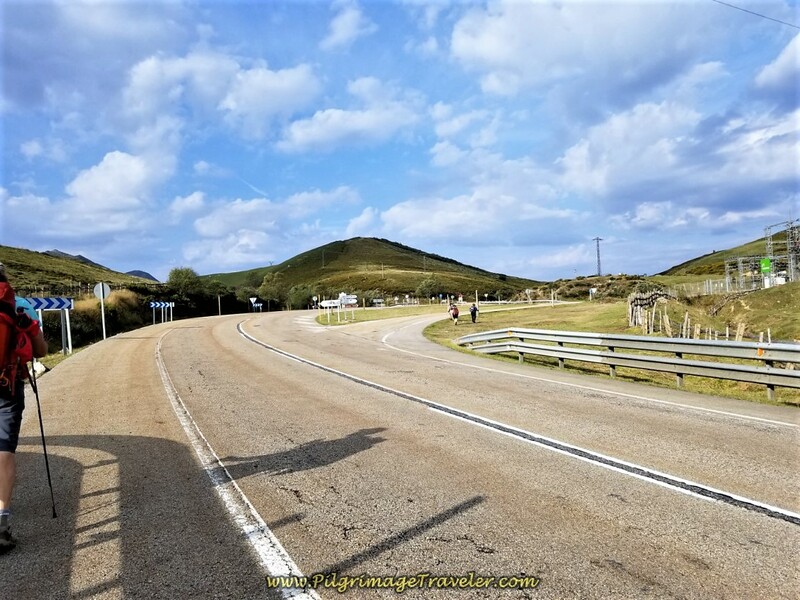 Once you pass the turn-off to the albergue in Pajares, you are essentially committed to go the entire 30 kilometers, unless you want to pay a small fortune to stay at a Casa Rural in San Miguel del Río. These rural homes are designed for ski-hill tourists and not the peregrino! Not only may they not be open, but they may only take a minimum reservation of two or more days. Not a good idea. I suppose you could also hire a local to drive you from St. Miguel del Río to Pajares, if it comes to that. Or walk the oh-so-steep 1.69 kilometers, back uphill to it. However it works out for you, just be aware that this is a killer stage and if you decides to go on, you might regret it, as we did. It is a 20 kilometer pounding downhill the entire way after the turn-off to Pajares! 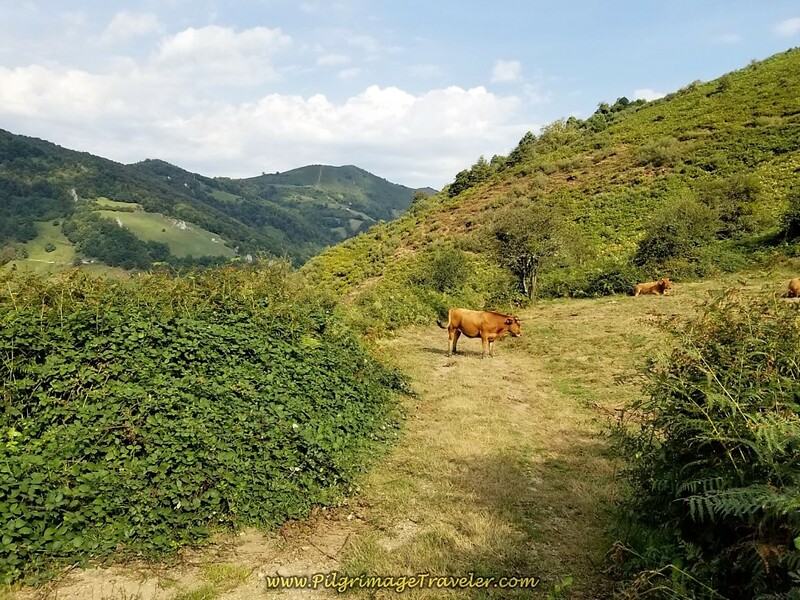 Even though day three is the most beautiful day on the Camino de San Salvador, it will test the strongest of knees. Mine were put to the extreme test! Here is our Google map of day three, with the services placed on it as usual. 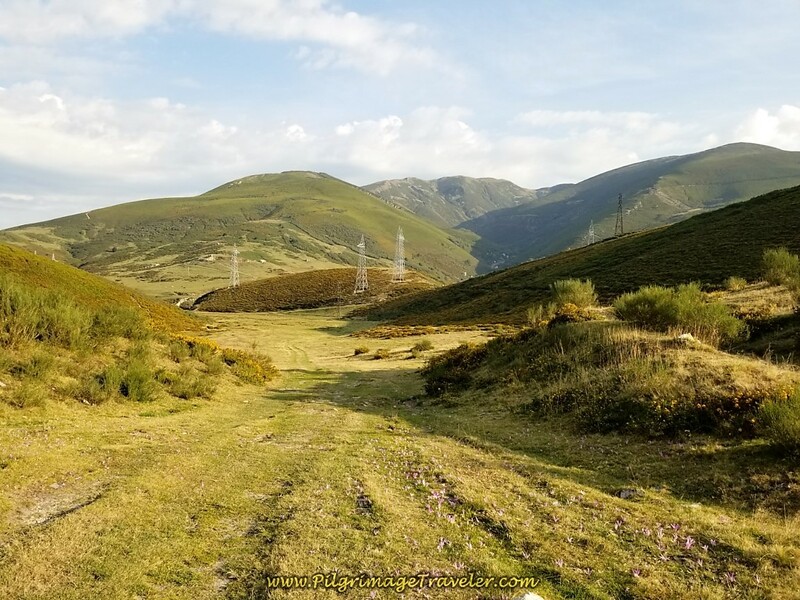 This is our entire stage, however, this article for day three covers only about half the journey to San Miguel del Río at almost exactly 15 kilometers into the day (15.27 to be precise). 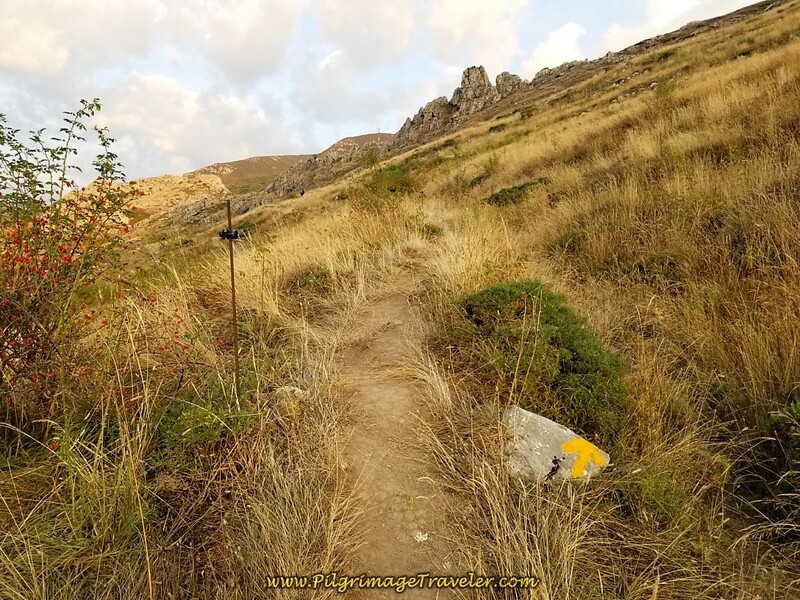 Carry food and water in your pack for this stage as the services are few and far between! Also carry your food for dinner if you are planning to cook in the albergue in Pajares. The town has no grocery store. 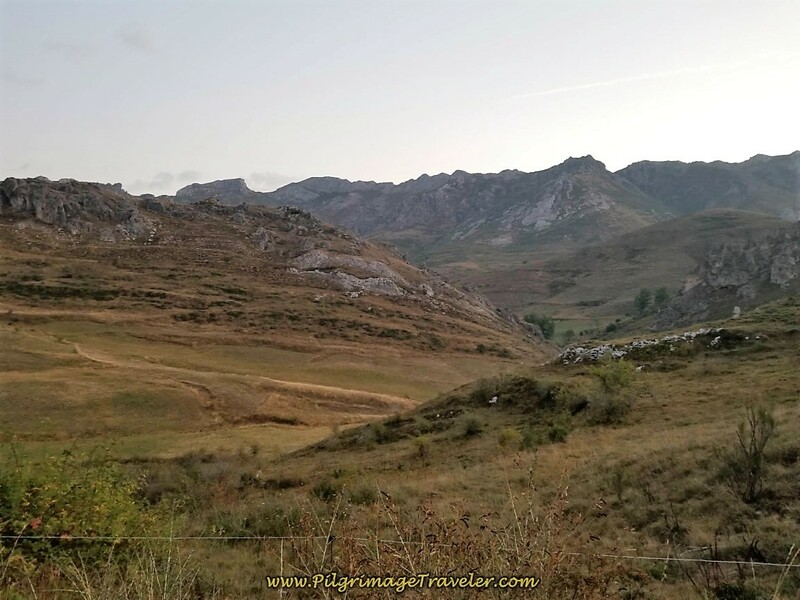 The last grocery store is in La Pola de Gordón, way back on day two. There is a restaurant in Pajares, and hopefully it is open when you arrive. I have heard that the hospitalero in Pajares may assist you with food if the restaurant is closed. As you can see from our elevation profile below, to do the entire way from Poladura to Campomanes took us almost 10 hours. It was a Herculean effort for me. 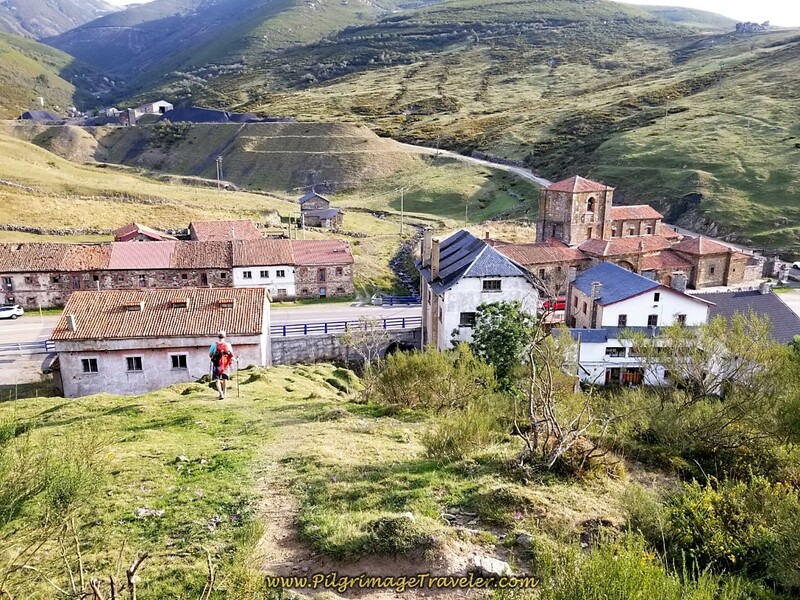 Several of our Spanish friends did this entire stage, but stayed in the albergue at Bendueños (+34 674 67 17 06), 1.59 kilometers shy of Campomanes, where we ended up. Call ahead if you wish to stay in Bendueños, as they must obtain enough food for your dinner. There are two high points of the day, after the Cruz de San Salvador, a bit more that halfway up the first cimb. 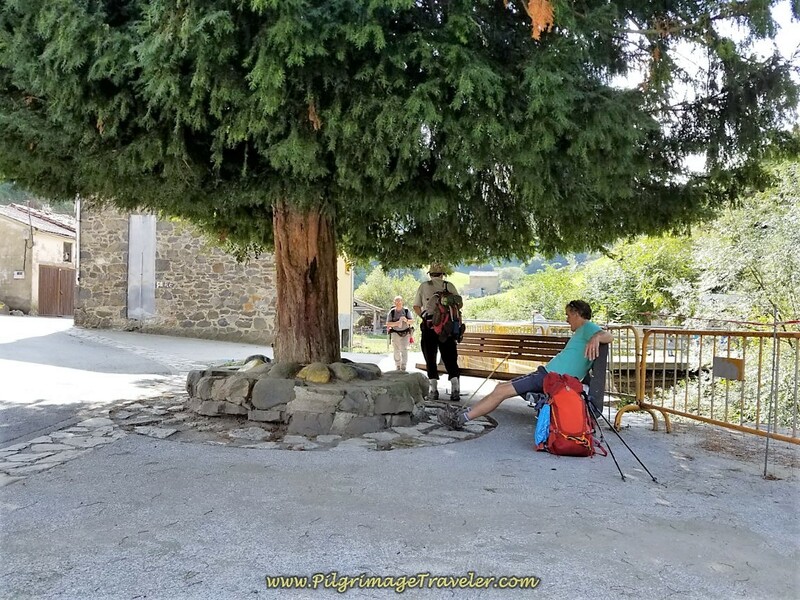 Our day from Poladura to Campomanes was 30.4 kilometers (18.89 Miles), and to Bendueños it is 28.81 kilometers (11.44 miles) if you have the proprietor pick you up at the square in Herías (or Erías). 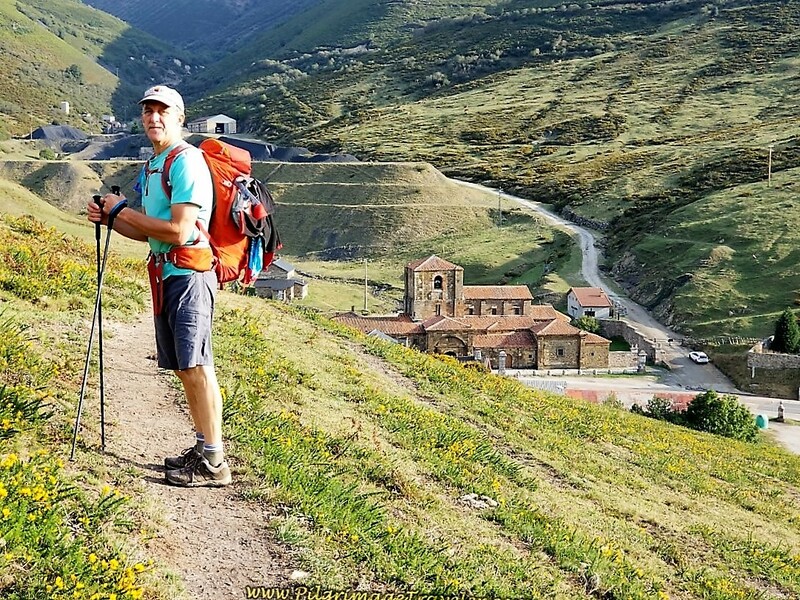 Otherwise, add an additional 1.5 kilometer to their albergue from the Camino. 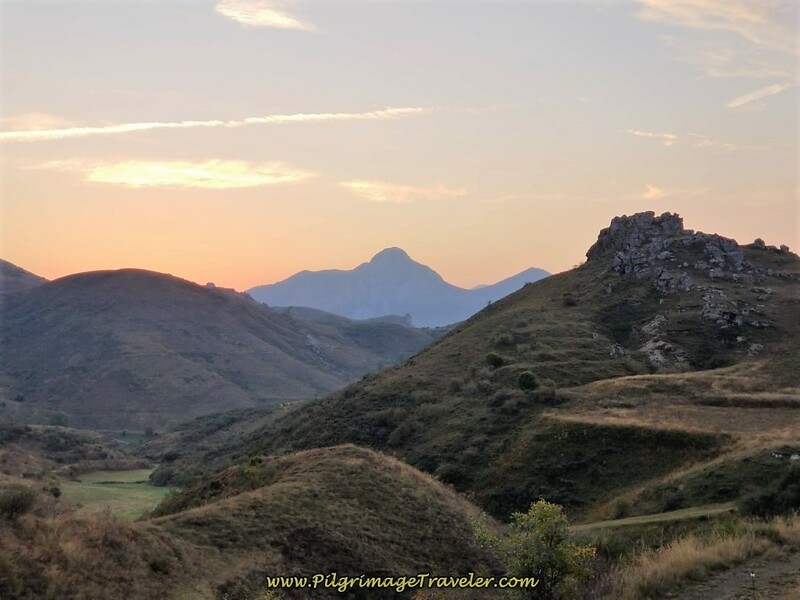 We were well-advised not to leave Poladura before sunlight, because you wouldn't see anything of the splendor that is this day three on the Camino de San Salvador. Since I don't like to leave before daybreak anyway, this was no problem for us. 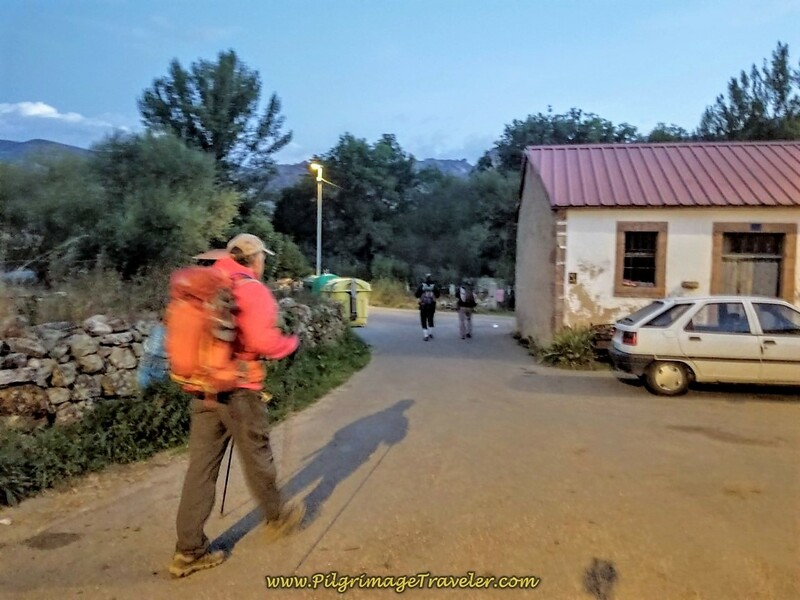 Here is Rich and our two Spanish friends setting off from the albergue/Posada just as day was breaking. At the end of the street, past the small building above, turn left and then an immediate right onto this lovely dirt trail, shown below. 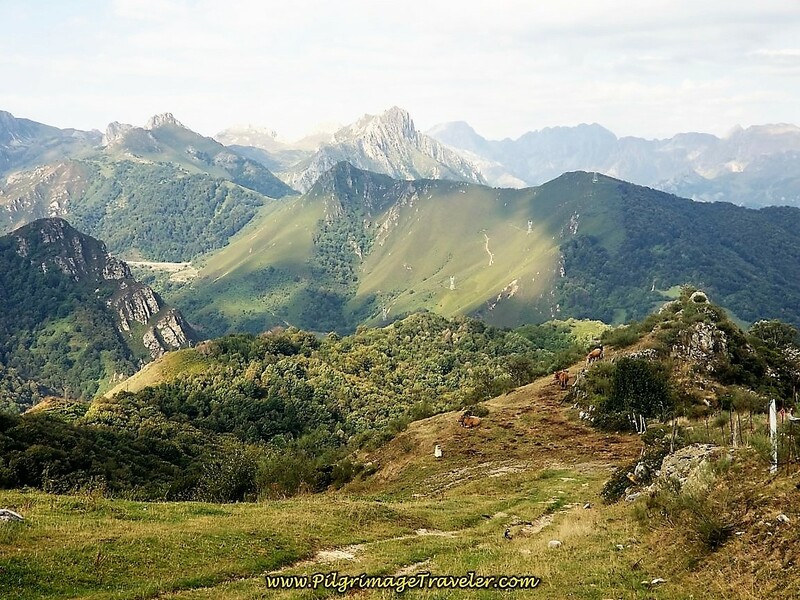 Your day in the splendor of the Cantabrian mountains has just begun! The morning at this elevation in late September, was cool and crisp and we were to enjoy a fabulous sunrise. 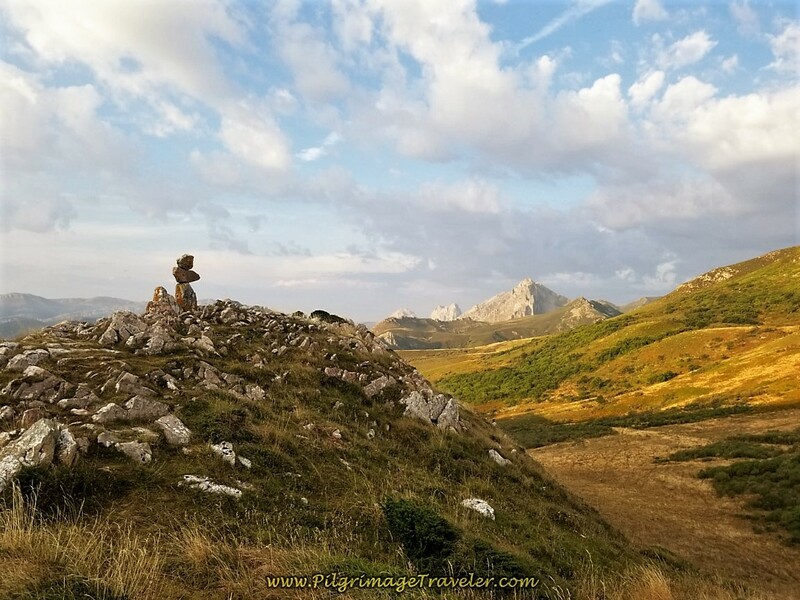 I tried to study other blogs and maps to get the names of the mountain ranges correct, however, it is possible that I failed to get it right. If I need correction, please contact me and let me know! I primarily give credit to Ray y Rosa and Xurde Morán. Thank-you! As we gained in elevation, the mountain ranges loom above you from all sides. 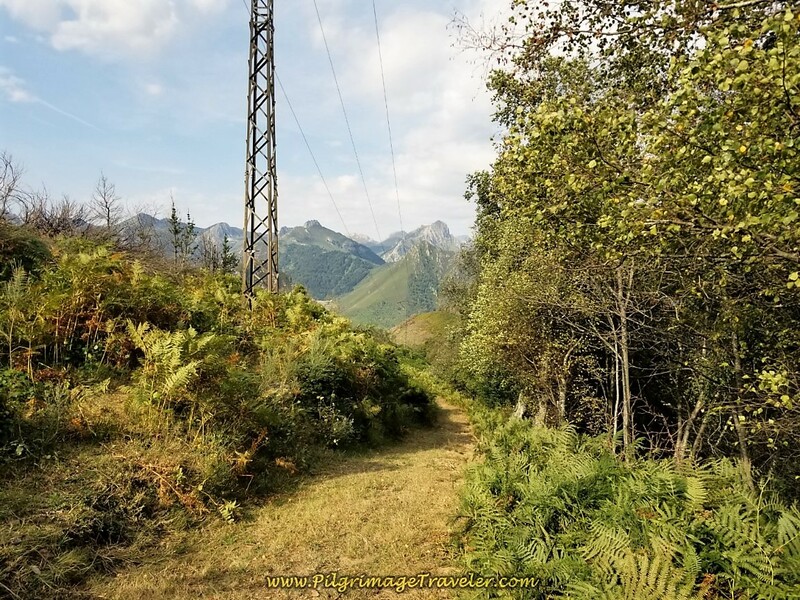 The trail merges with a wider tractor track within a few hundred meters. 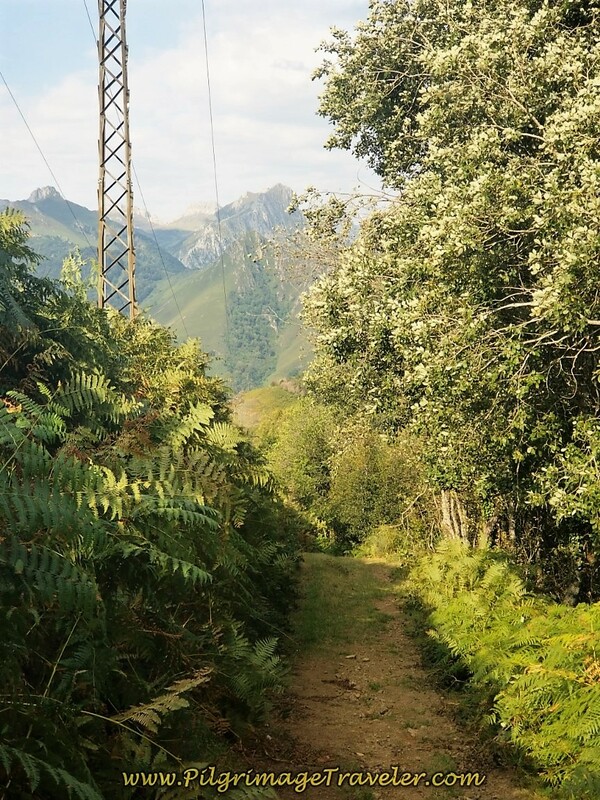 Here, on these tracks we are approaching the Picos de Las Golpejeras. 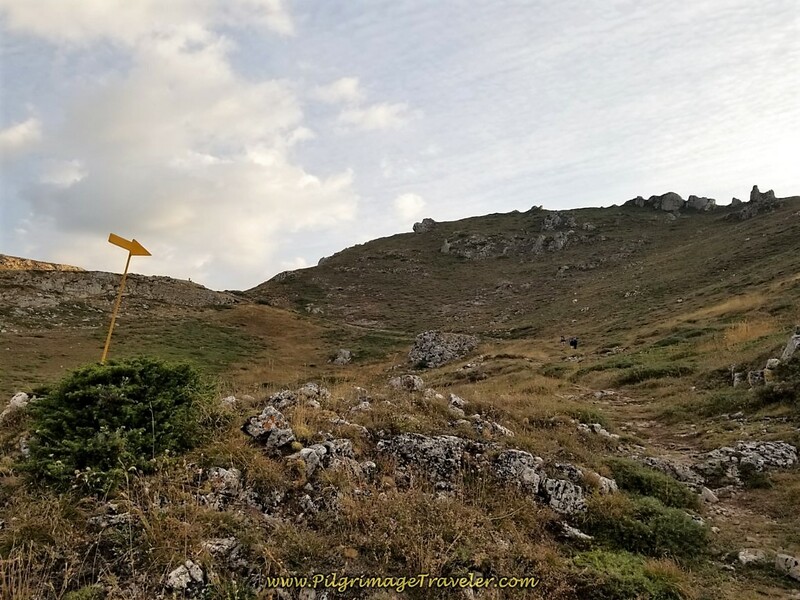 Our first destination landmark is the Cruz de San Salvador (Cross of the Savior) on the high point called the Alto de Los Romeros (High Point of the Pilgrims). On the way to this point, we were treated with a gorgeous sunrise, accompanied by a full moon. Wow! We couldn't have planned it better! Continuing straight onward, the tractor track slowly peters out into a single trail. You can clearly see the way ahead in this photo, with the diagonal cut ascending across the ridge. 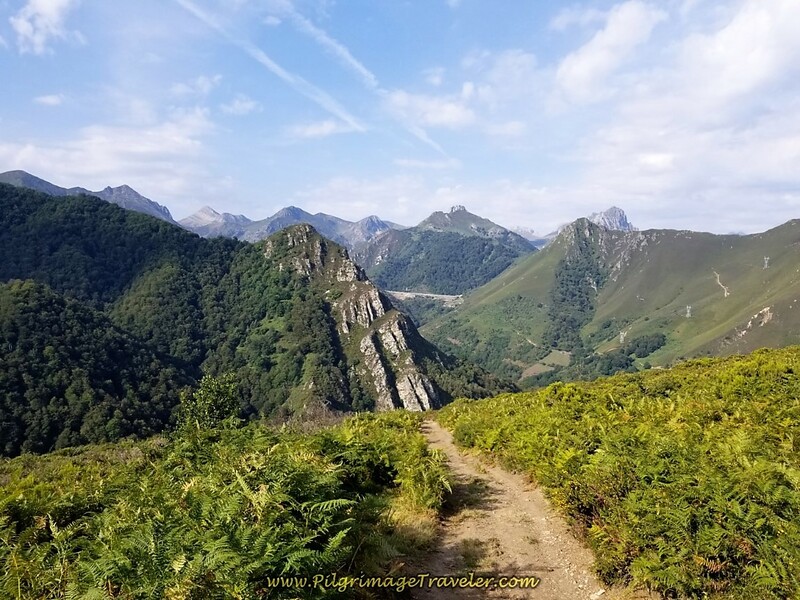 The Cruz de San Salvador, is barely discernible among the rocky crags in the photo below, but clearly visible to the naked eye by this point. Here is our first photo where the cross is clearly visible. 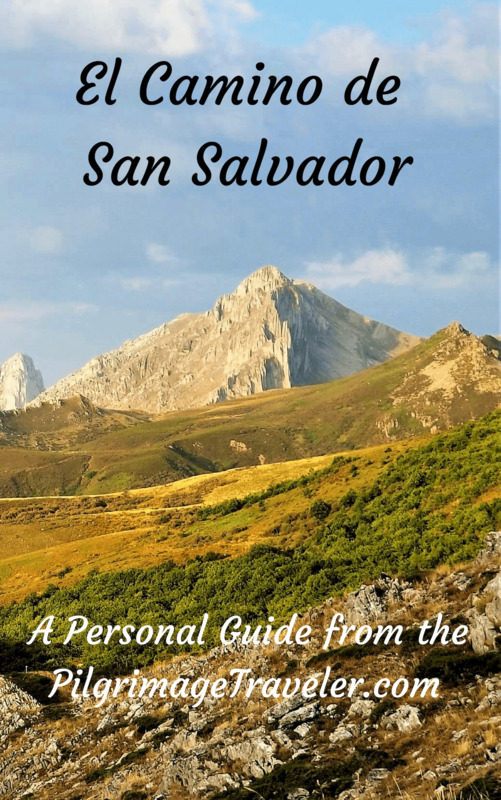 At 2.67 kilometers come to the Alto de los Romeros and the Cruz de San Salvador at last. The elevation is 1452 meters (4764 feet). 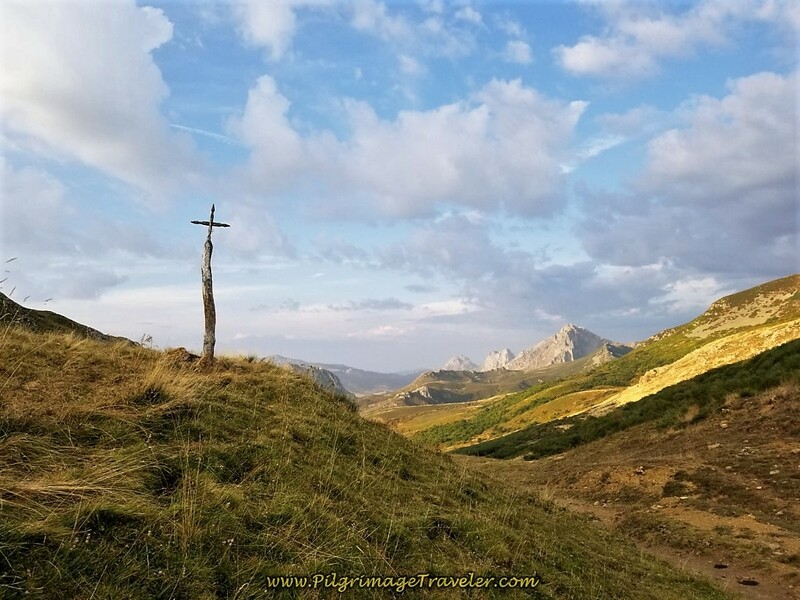 It took us almost one full hour to reach here, with the climbing, the frequent stops for all my photos and hanging out by the cross for awhile! The views are glorious all around! The early morning sun had finally broken through and lit us up, just for the cross photos! 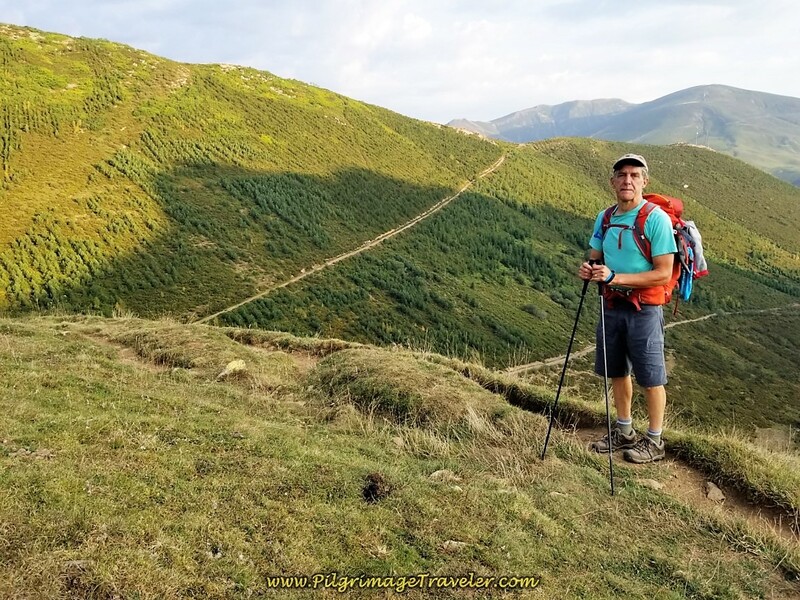 Continue climbing after the cross, at a steep pitch, across this meadow to the next landmark, the Canto la Tusa, or the name of the top. 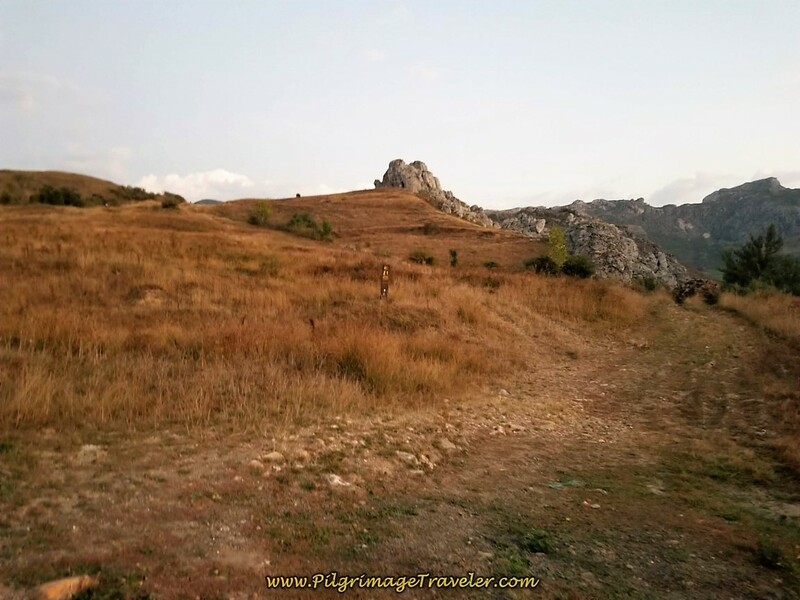 Just beyond the Cruz de San Salvador, you can see a cairn in the distance. Arrive at the cairn at 3.07 kilometers. You are not quite yet at the top. Some describe this as a cross cairn, others think it looks like a person with outstretched arms and yet others see an angel. This is also a nice look-out point. 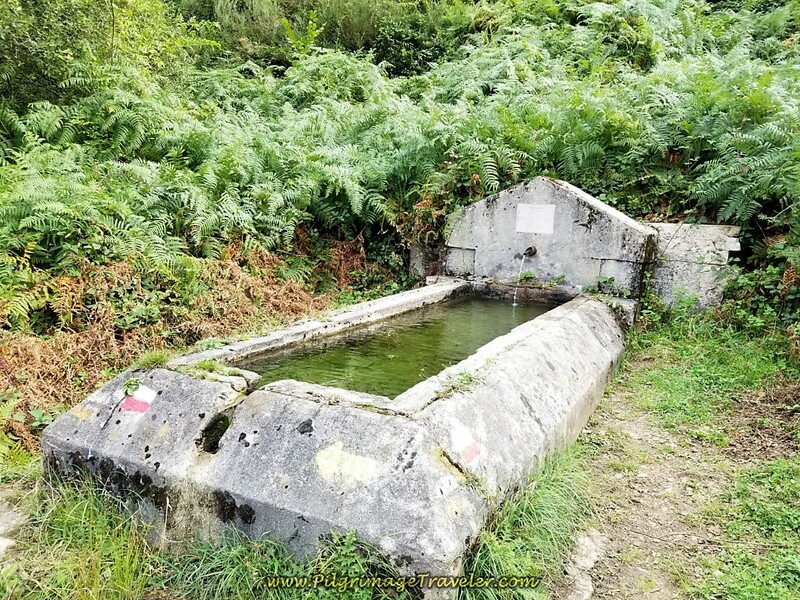 At 3.49 kilometers into day three on the Camino de San Salvador, arrive at this small cross, and an obvious top, the Canto la Tusa. 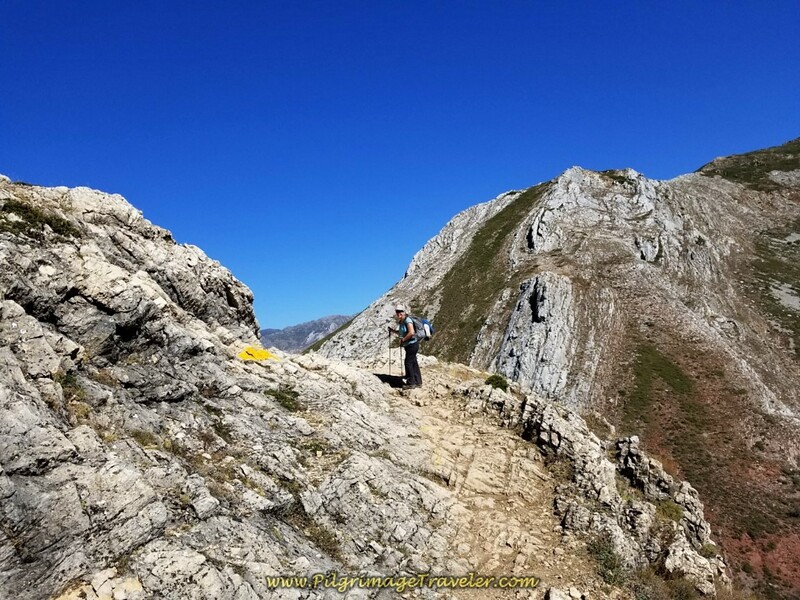 My GPS recorded the height of 1568 meters (5144 feet), but I have seen various figures within 10 meters of my recording. 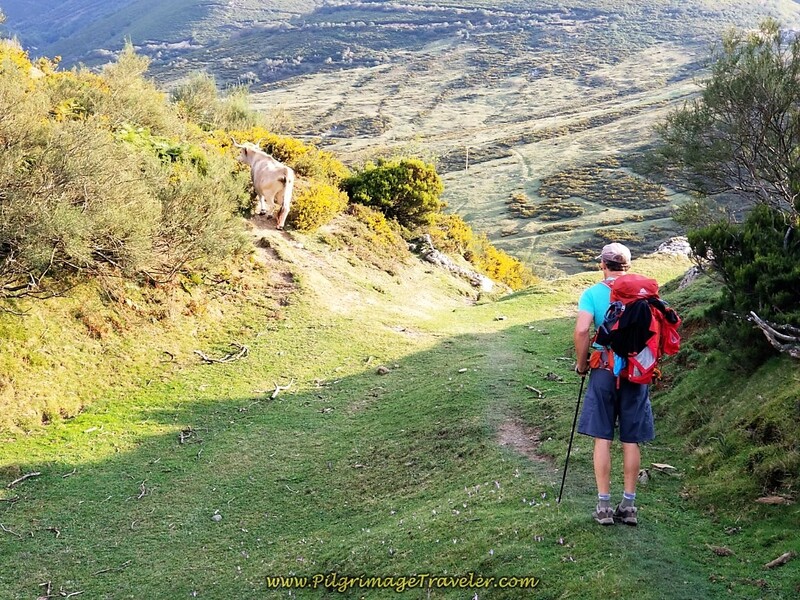 From the other side, the Camino descends very steeply! 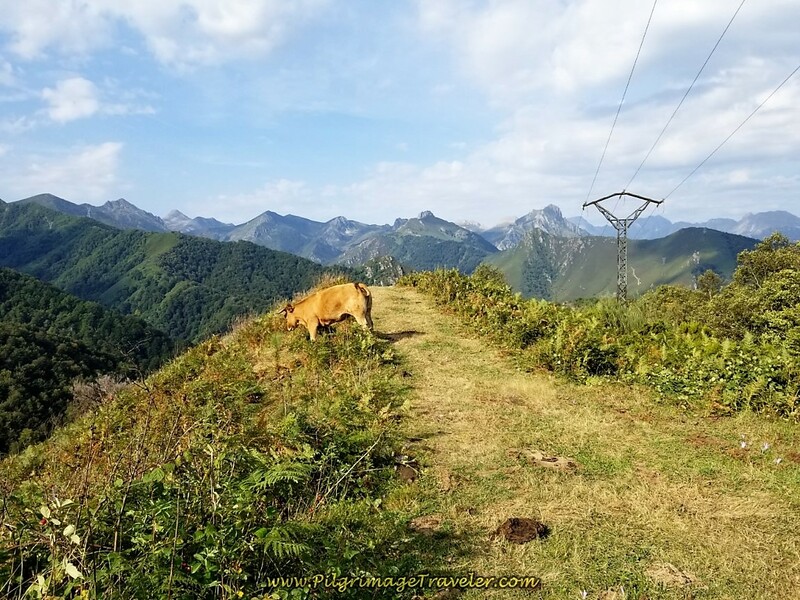 Begin your descent of the top, with the massives of the Montes de Peñalaza on your right and the town of Busdongo de Arbás in the valley floor below. 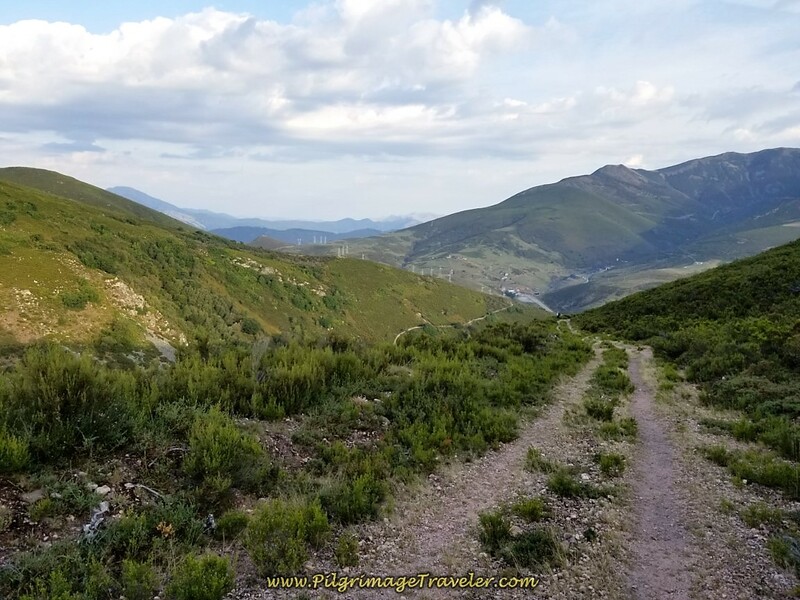 At this photo, a bit farther down from the top, you can see the Sierra del Cuchillo mountain in the distance, with the Camino visible to the second top, the Vista Arbás, our next landmark. 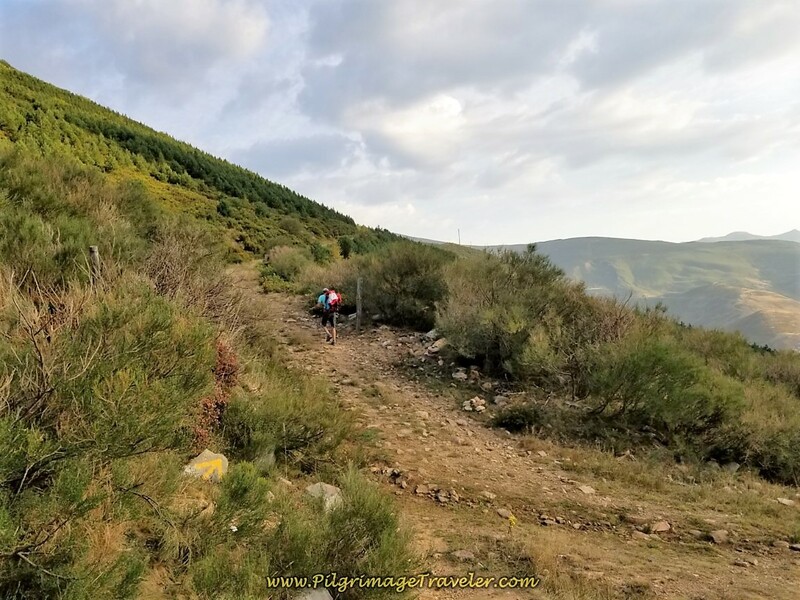 Once at the bottom of the ridge from the Canto la Tusa top, the trail takes a strong bend to the right, and in about 100 meters joins a wider road. Turn left and up the hill on this road. 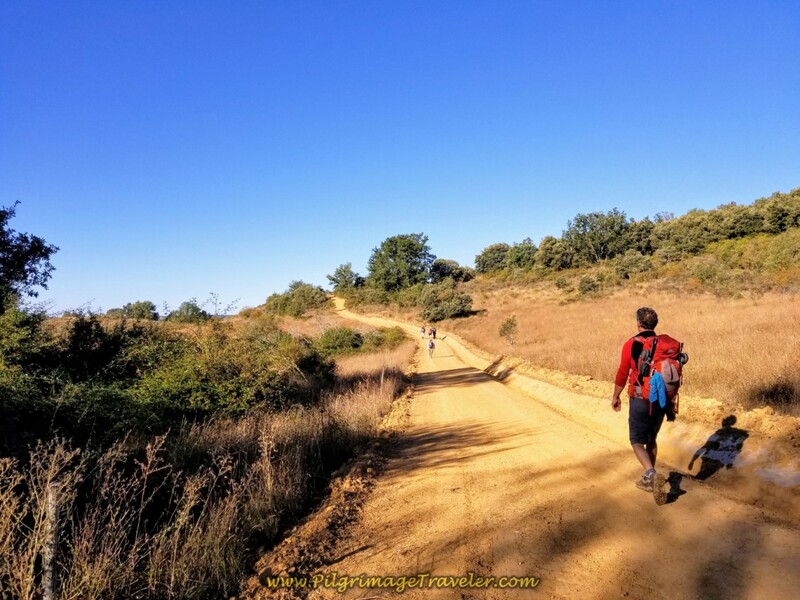 The way to the Vista Arbás is steep, loose and rocky. I was glad it was dry when we negotiated it. Weather would only add to the difficulty and require more time to climb it. 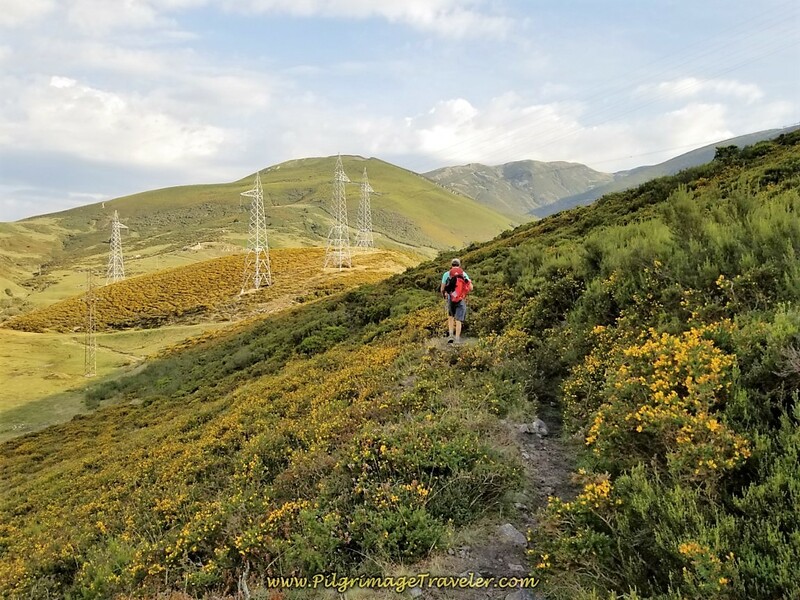 Almost at the second top, in the photo below, we can see the Montes de Peñalaza in the background, and the summit of the Canto la Tusa in the saddle to the right. It looks really far away doesn't it? It is only about 1.3 kilometers! 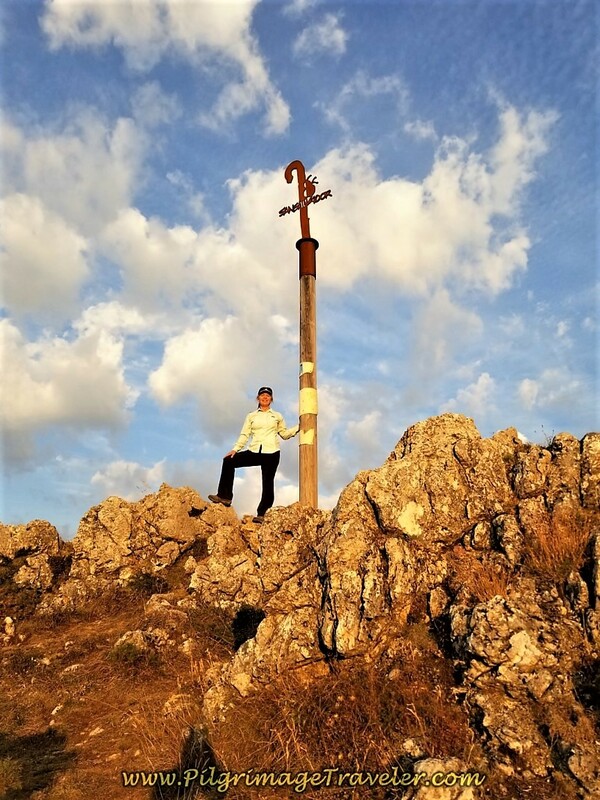 At 4.84 kilometers, come to the second top, called the Vista Arbás at 1560 meters (5118 feet). There is a yellow arrow on the ground. Come to the gas line at the top also with yellow markings (not shown). 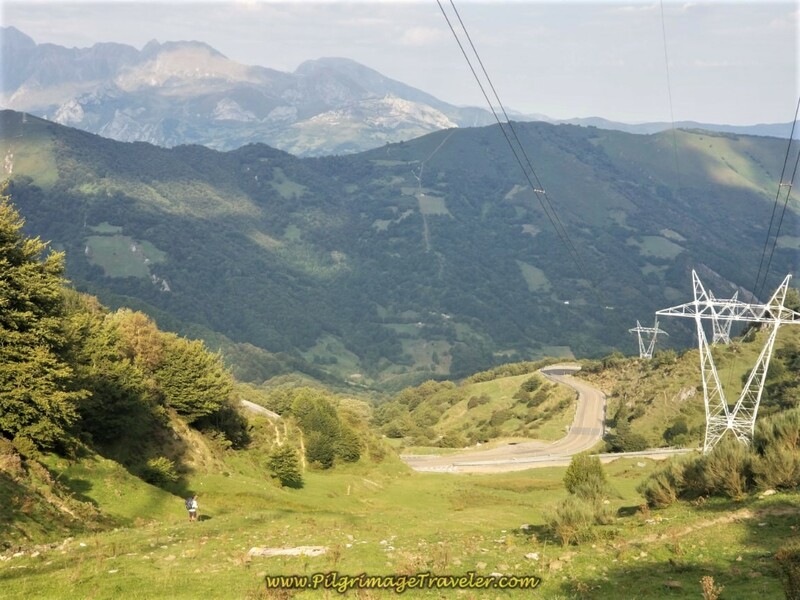 You can also see power lines ahead in the valley below and toward the next town of Arbás del Puerto. 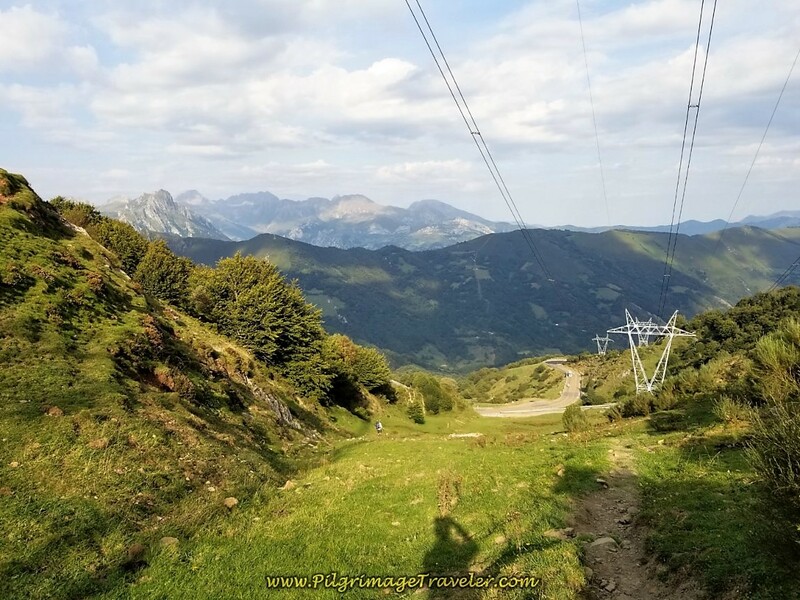 If you look closely to the mountains to the left, you may be able to make out the ski lifts of the Valgrande-Pajares ski resort. The trail is well marked here. Follow the trail from the top, straight on, staying to the right at any intersection. From the top walk another 650 meters, and follow the waymark below, and make a turn to the left at this waymark, to continue a strong descent. Come to a gate in a few more meters. We caught up to an Australian bloke here. When you come off the top, the way is quite loose and gravely, a bit tricky to negotiate. The knee-deep bracken will scratch your legs through here. I was happy to have long pants on. It does get grassier after the stream. At 5.79 kilometers, come to a stream (arroyo), which is the bottom after the second top. Start another small climb after the stream. Continue on the roadway, straight on, following the well marked path. You can see the water was flowing through here, as I imagine it does for most of the year. Our next destination, are the stone buildings ahead. 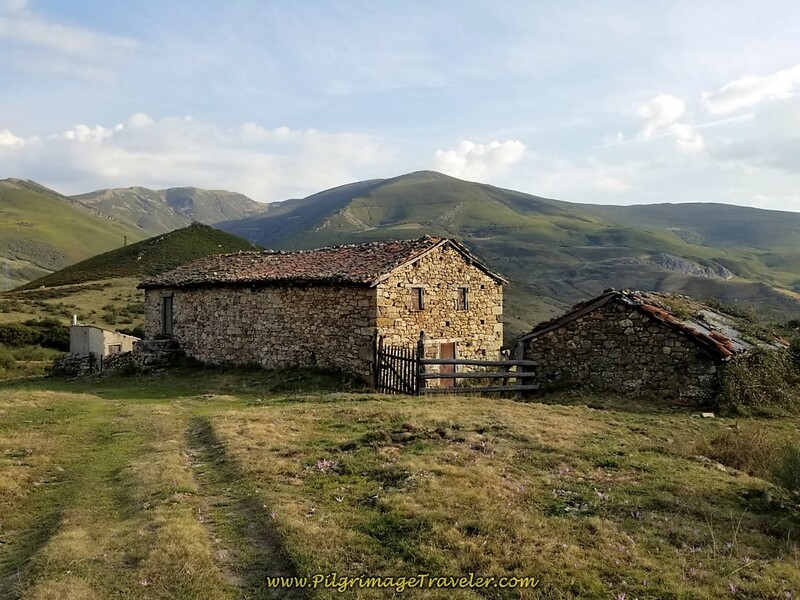 These lovely old stone buildings are right before the next stream crossing of Las Caballetas, the name of the arroyo and the mountains behind it. Only 200 meters after the stone buildings, come to this juncture in the valley, shown below. We almost missed the signpost for the high path, shown in the next photo. 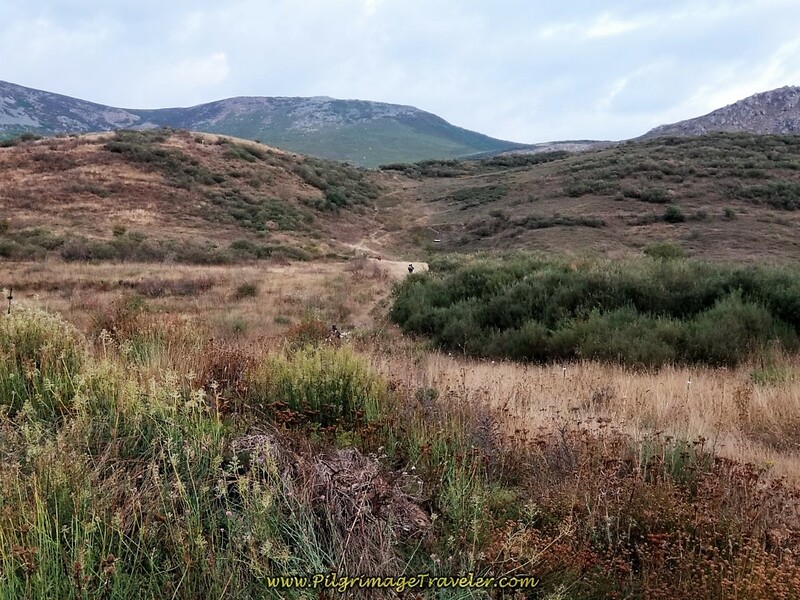 We continued to stay left of the signpost and walked down the open tractor tracks by mistake. 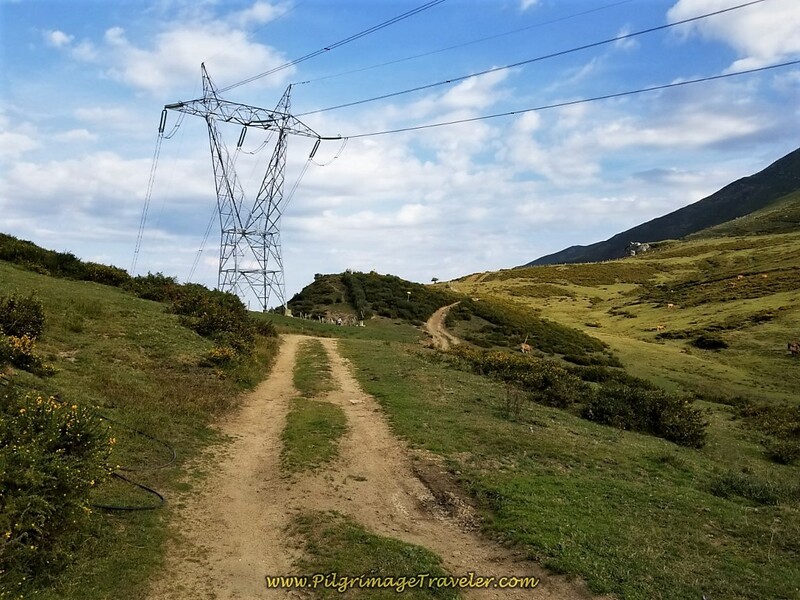 You could stay left on these tractor tracks for a shortcut to the N-630, which the Camino eventually joins anyway. However, you will miss the wonderful and historic Colegiata de Santa María de Arbás if you take this shortcut. I'm not sure how I realized we missed this turn, most likely because I hadn't seen a recent waymark, so we double-backed and found the turn, fortunately! 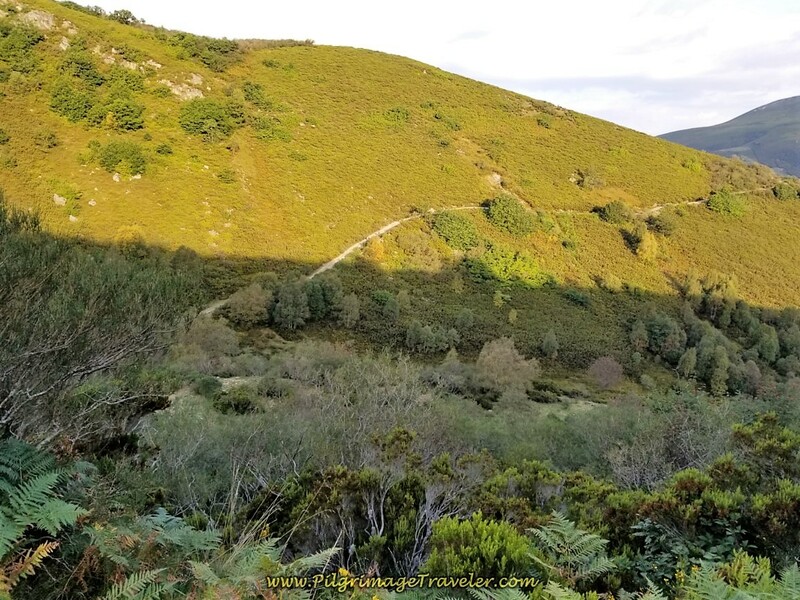 This is one of those sections on day three of the Camino de San Salvador, where the path is not well-maintained and becomes scrubby as it stays high on this hillside. The actual path gets faint at top of the ridge, but it is a wide cut through the brush here, and not too hard to follow. And then suddenly, an old mine comes into view ahead, and then, the Colegiata de Santa María de Arbás below it. Here is Rich, posing for me at this lovely viewpoint. Your descent from here to the road, the N-630 is dramatic! 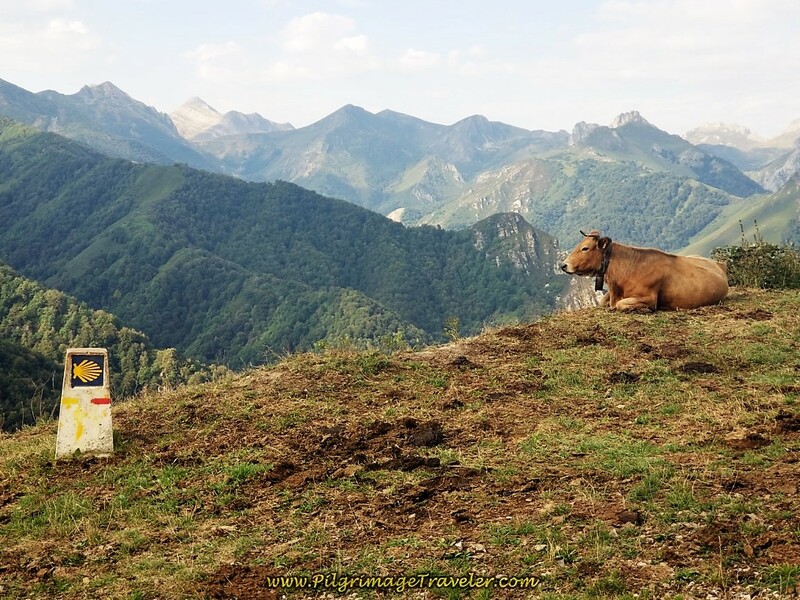 Coming off the final shoulder toward a farm below, pick your way through the cow paths, a choice of multiple ways. Look to your left side of the farm and shoot for the gate. 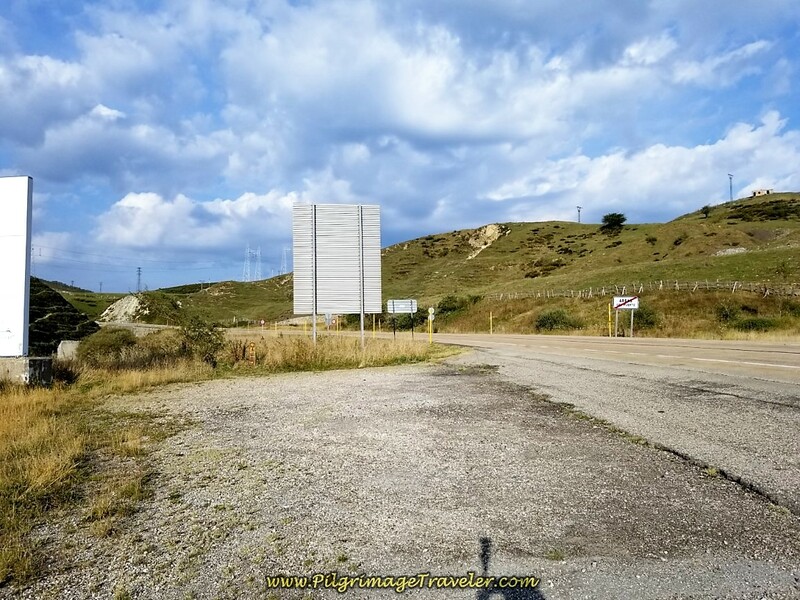 There is a wooden camino sign just beyond the gate and a very small faded, painted yellow arrow on the gate. There is another painted arrow on the small concrete side building as well, if you look closely in the photo below. 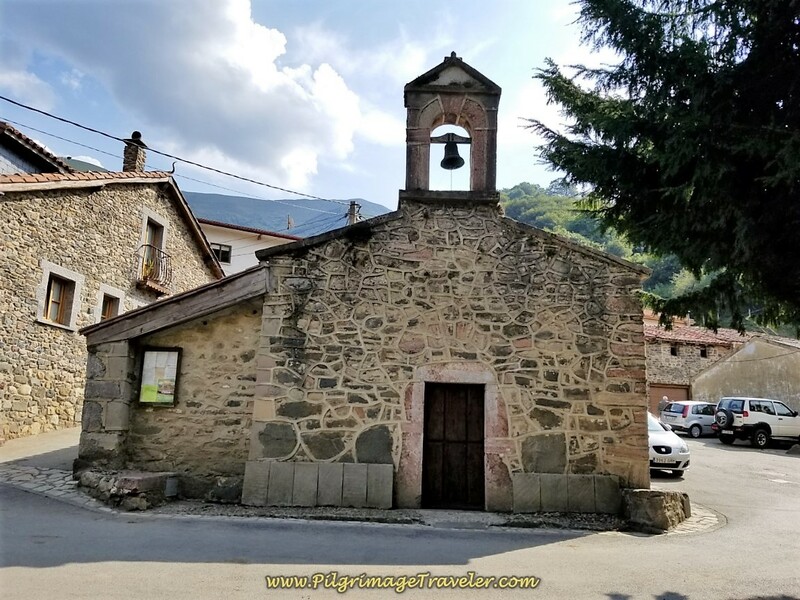 At 7.8 kilometers, on day three of the Camino del Salvador, join the N-630 in the town of Arbás del Puerto and walk off Camino a few meters to the fabulous and historic Colegiata de Santa María de Arbás to the east. We actually saw some of the Spanish peregrinos chose not to go to the historic church, but kept on going. I guess historic churches are not on their priority list! 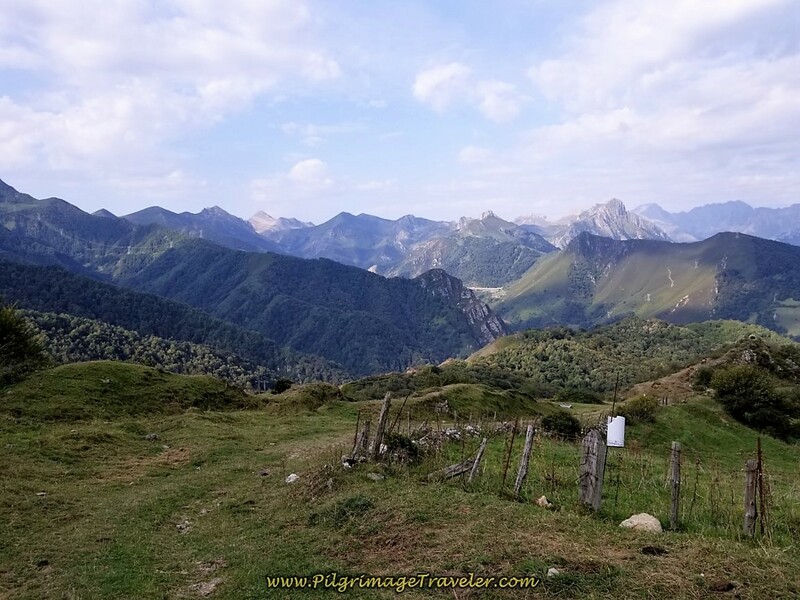 When you arrive here at the N-630, the Camino goes to the left. 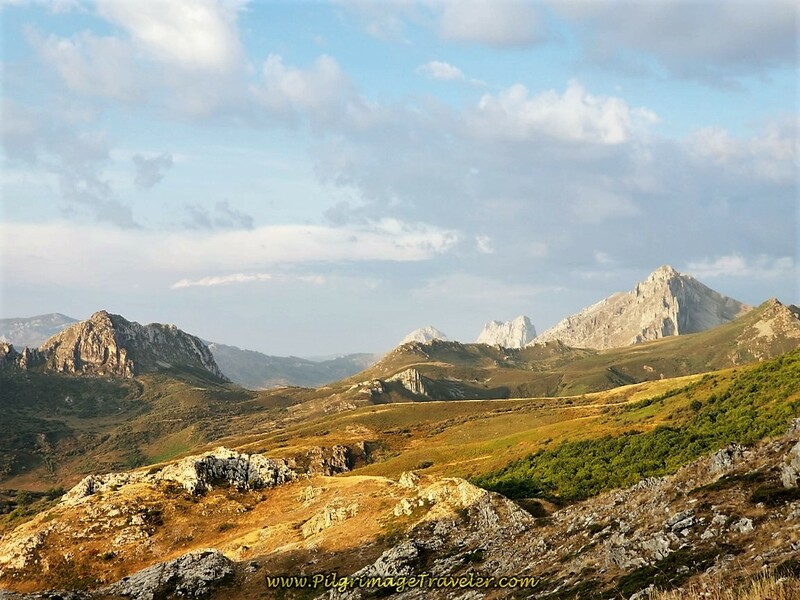 However, look to your right and see a sign for the town of Santa María de Arbas and the historic monument. Go to the right and within a few meters you come to the Colegiata, shown below. There is also a fountain here, across the street, if you need to replenish your water supply. The inside is quite stunning, unique and in my opinion, worth the visit. 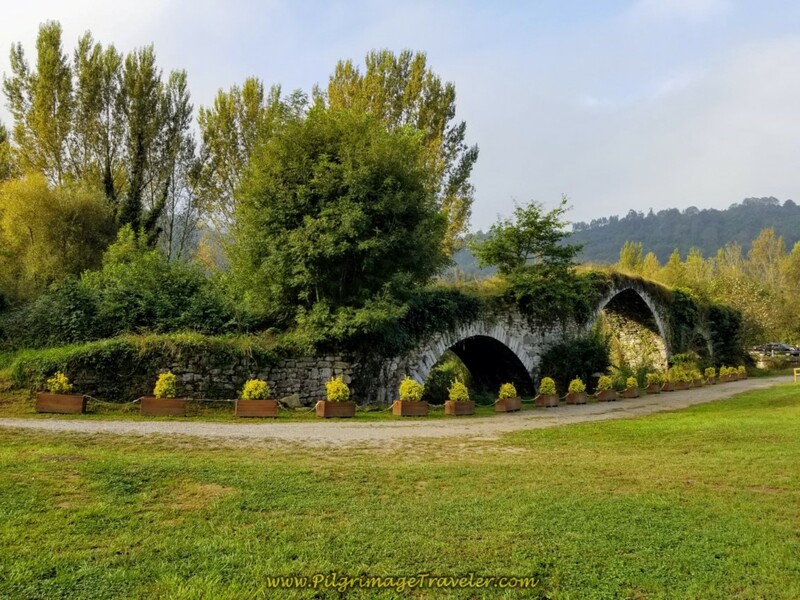 It was here, in the year, 1116 that a local count by the name of Fruela Díaz and his wife, with vast estates, donated land to build a hospital for pilgrims at a spring from the headwaters of the Bernesga River, just before the Puerto de Pajares, the high mountain pass. 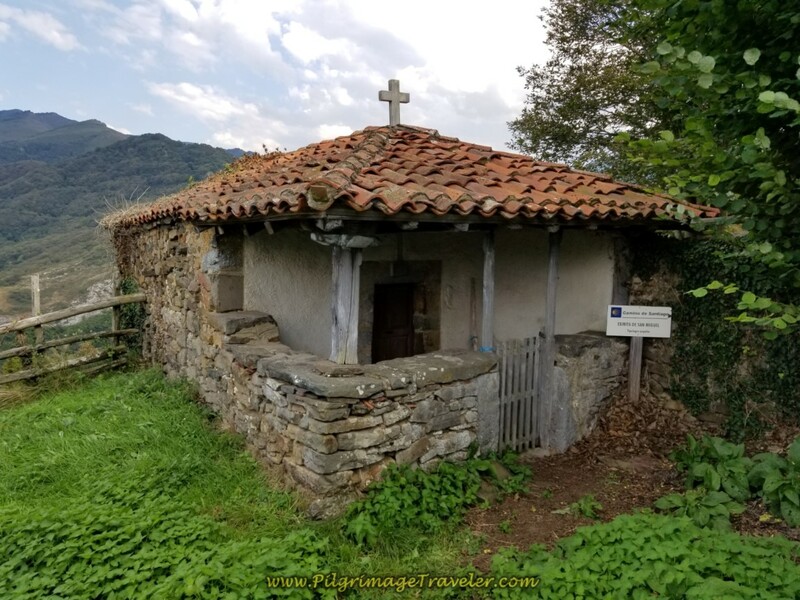 He chose this location to build because it was especially dangerous for pilgrims to cross over the mountains in Pajares, on their way to the holy relics in Oviedo. The pilgrim's hospital was also known as the "Casa de los Pobres" or the House of the Poor, since he would take in the poor as well. 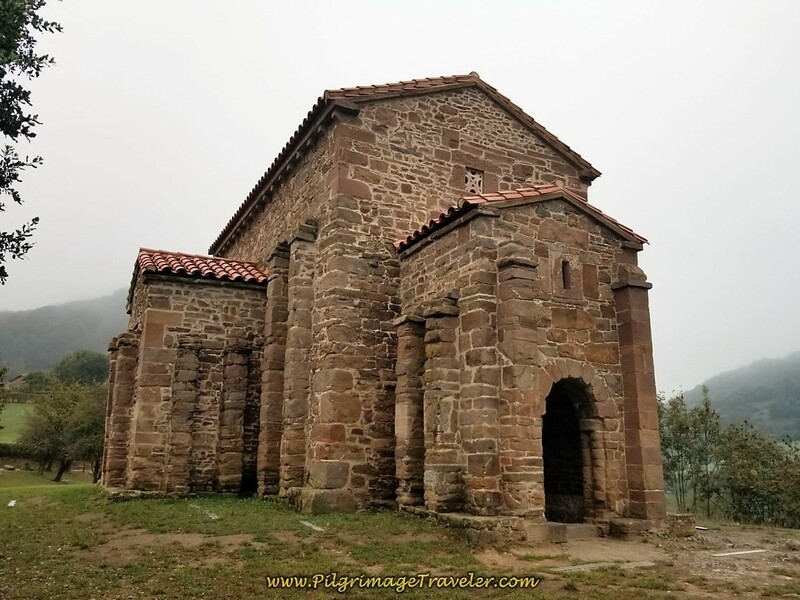 Then in 1216, King Alfonso, IX from León ordered that a church be built here beside the lodge. And thus, after years of various additions and renovations, the most recent in 2002, the structure that you see today stands before you. This church was declared an historic monument in 1931. 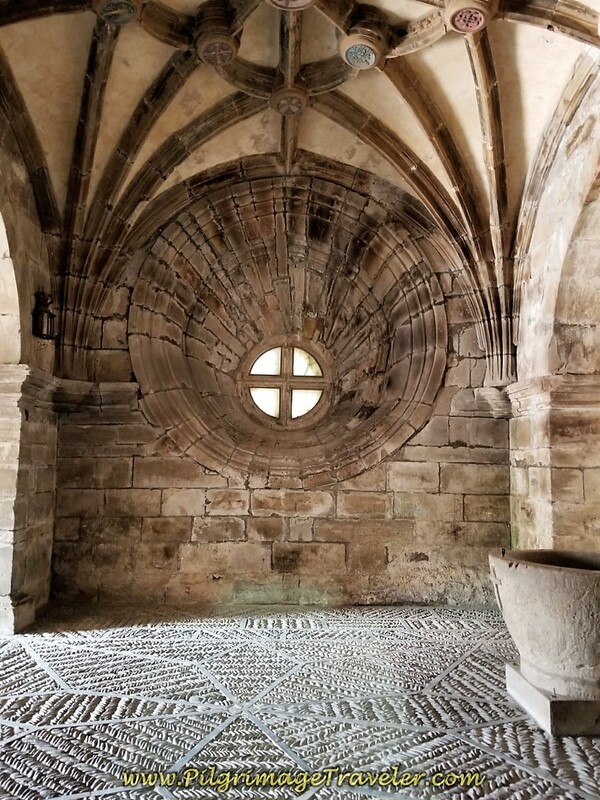 The rough mosaic stone floors are especially beautiful and the current building is in the Romanesque style of León. There is an large information board outside the church, that is in Spanish, so you may wish to read more about this place on the day before. Click here to read more about this historic place. 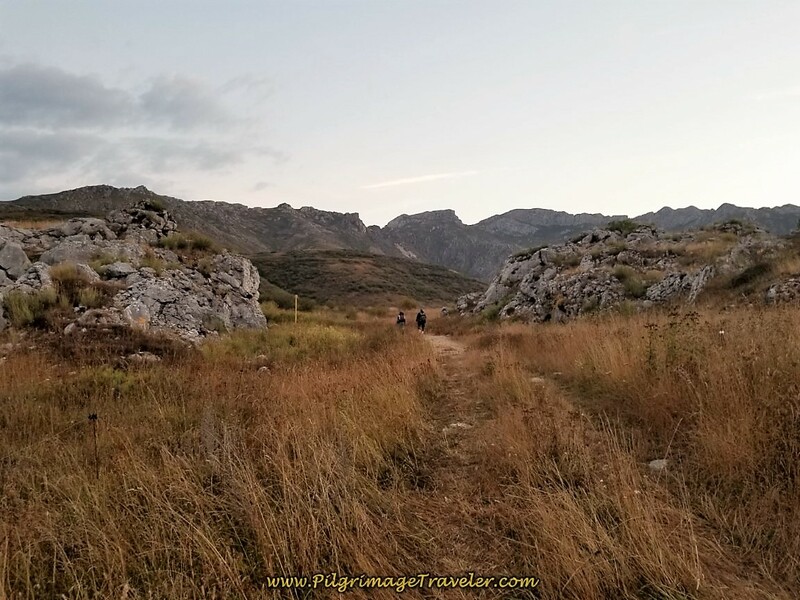 After visiting the Colegiata, return to the N-630, walking westward toward the pass, the Puerto de Pajares. Make a right hand turn at the sign on the way to the pass. 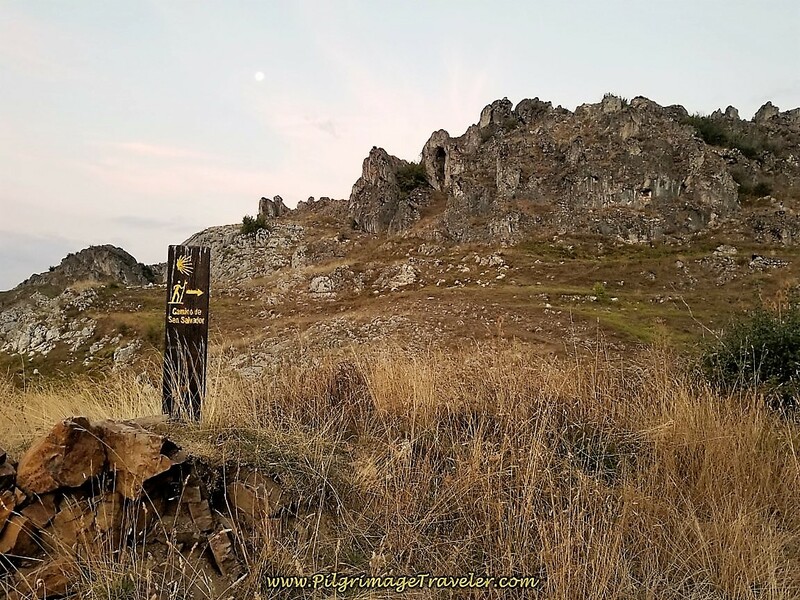 You can see the towers of the old Parador de Pajares ahead. I do not have a close up of the Parador. It didn't seem significant to me at the time, but it is a great landmark to find! t is now officially closed. At about 9.0 kilometers, come to construction area, before the Parador, and go to the right of the fenceline. To the left, on the fence, there is a sign for a bar, directing you to go left at the fence. The bar is straight on along the N-630 another 200 meters, called the Venta Casimiro. If you go this way, you can see the towers of the Parador Pajares, now looming above you. The Bar is just across the street from the now-closed Parador. 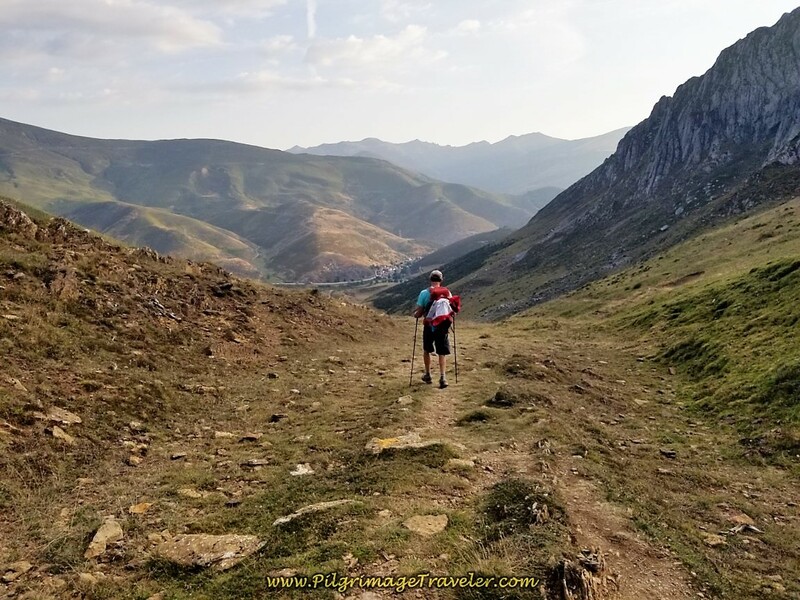 If you choose to go to the bar, you can continue on straight on the N-630 to meet up with the Camino at the Puerto de Pajares about 800 meters later. 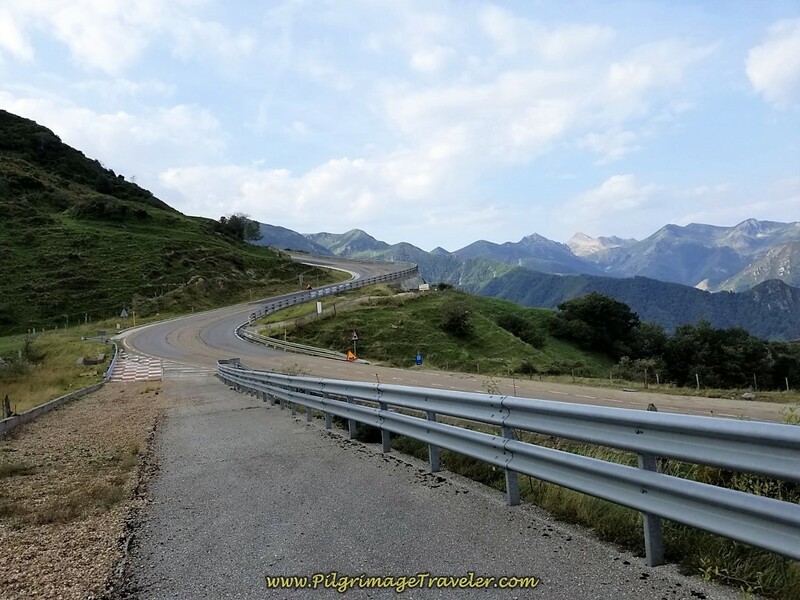 The road has no shoulder whatsoever, and has sharp curves through this mountain pass. I am glad I did not have to make this decision! 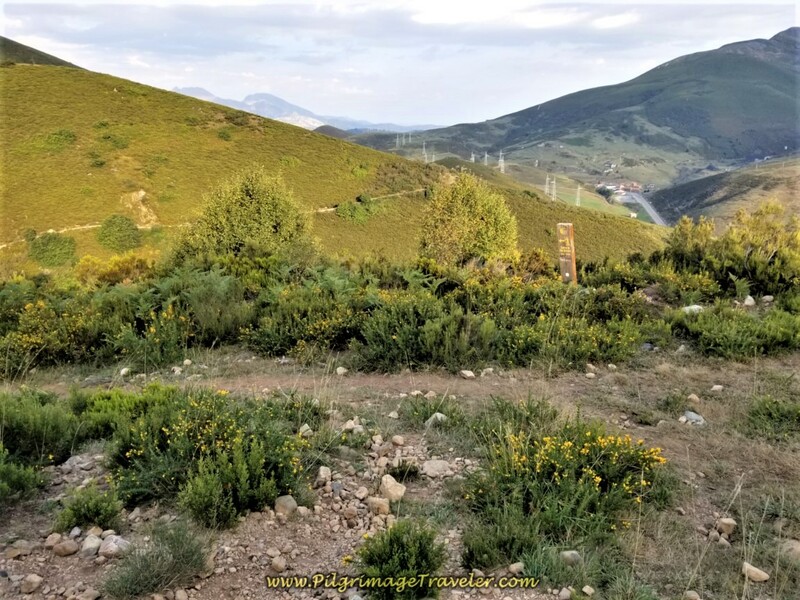 I have read from other pilgrims that from the Parador across the street from the bar there is a goat track that follows the highway, below and to the left (west). You can see this track clearly on Google earth. 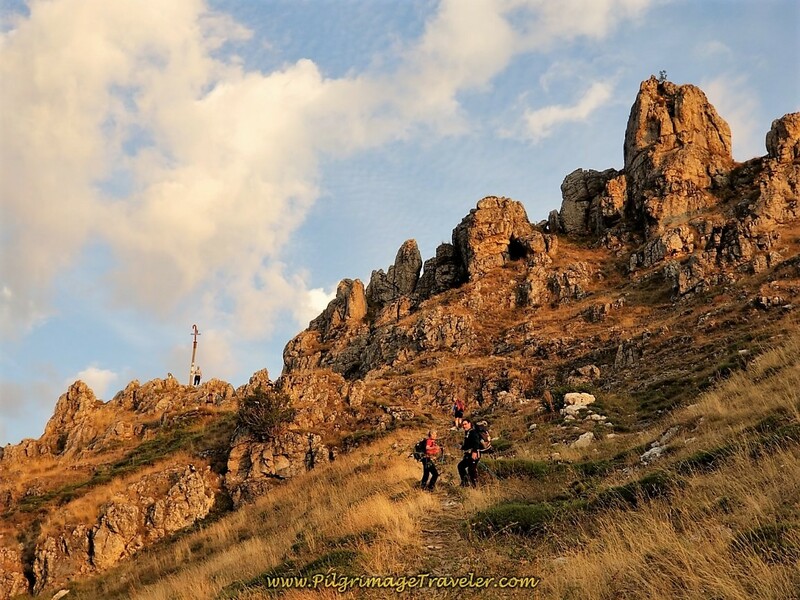 It has been said that this track is quite steep and difficult to navigate, so choose your direction wisely. 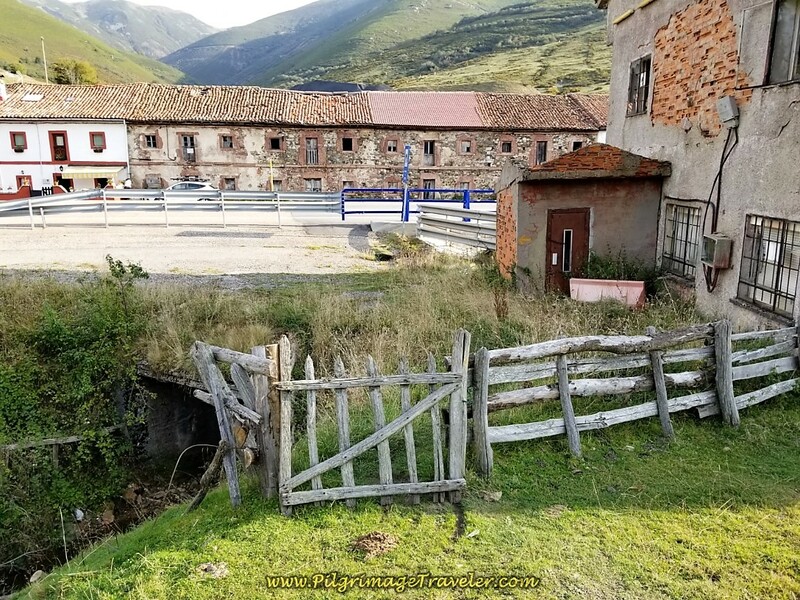 It actually may be safer and easier to walk the roadway through the Puerto de Pajares if you are walking in rainy, muddy or snowy conditions. 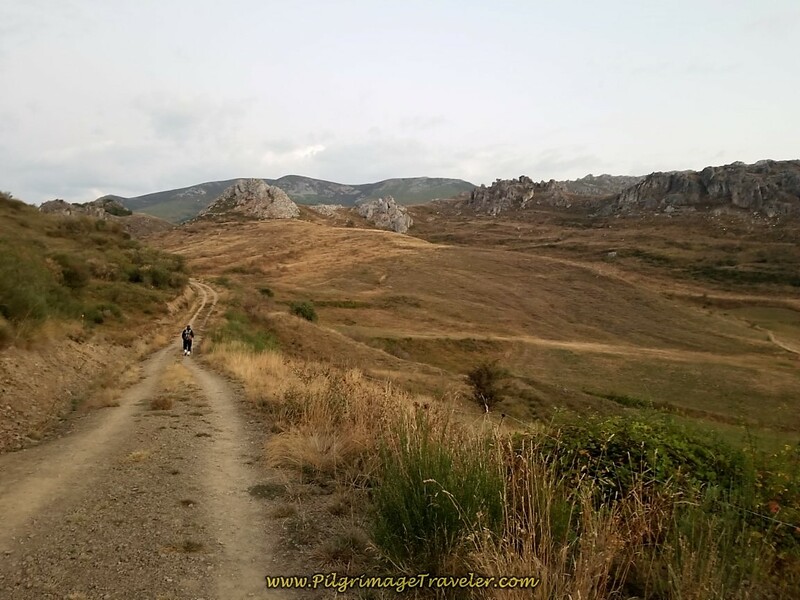 See the actual Camino route below to see what I mean! As you walk along the right side of the fence line, you will be directed to a tractor lane, shown below. 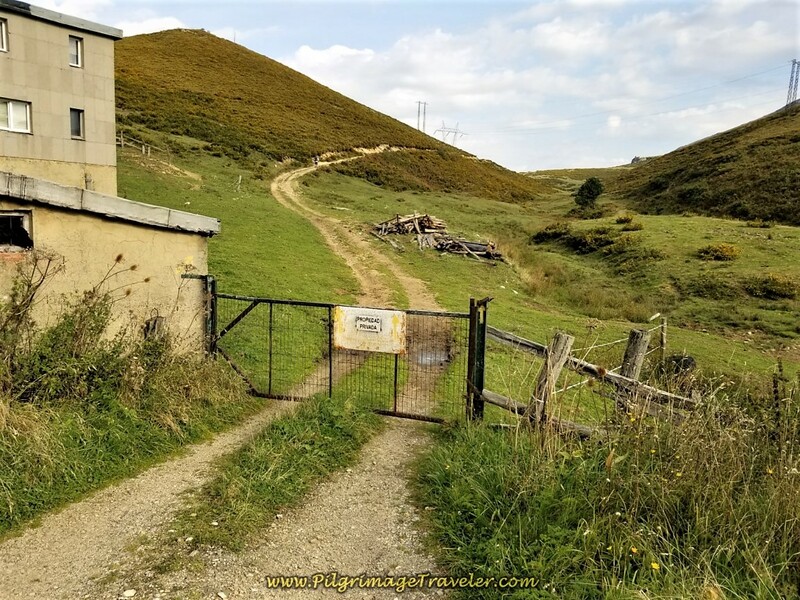 The sign on the gate says private property, however, the Camino is clearly marked to go right and through this gate. Continue climbing on this tractor lane towards the power line. 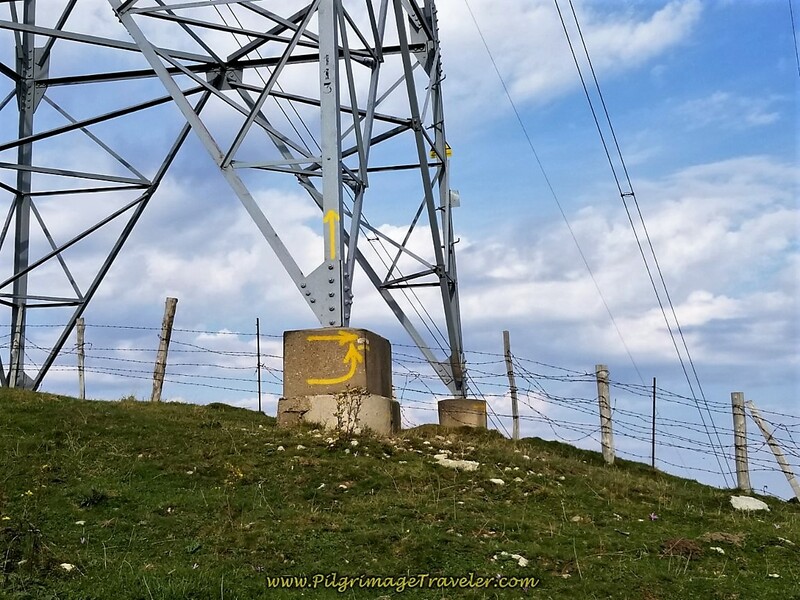 When you reach the power line tower, you will see yellow arrows on it. 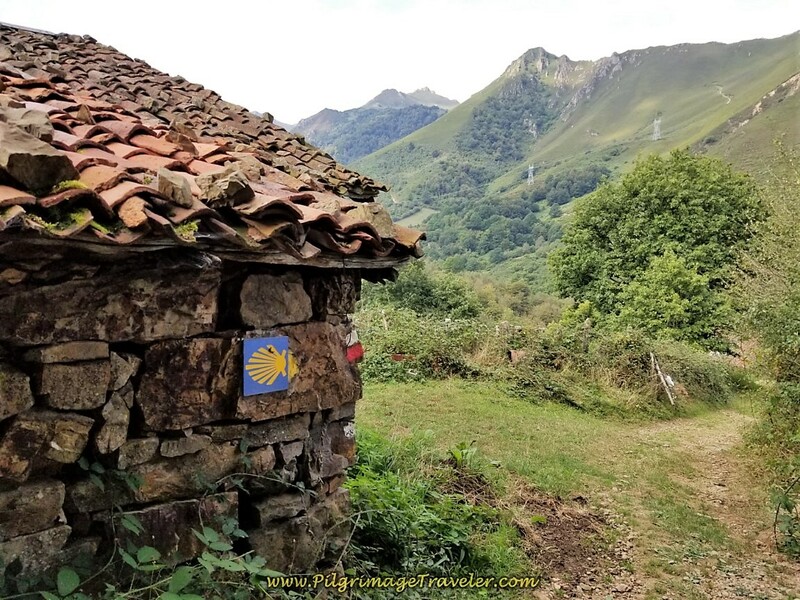 Just beyond the power line tower, 420 meters on the lane, you will see this gate, and your very first Asturian concrete waymark, now with the typical scallop shell, where the center of the ray points to the direction of travel! This gate marks the official Castillo y León and Asturias border. 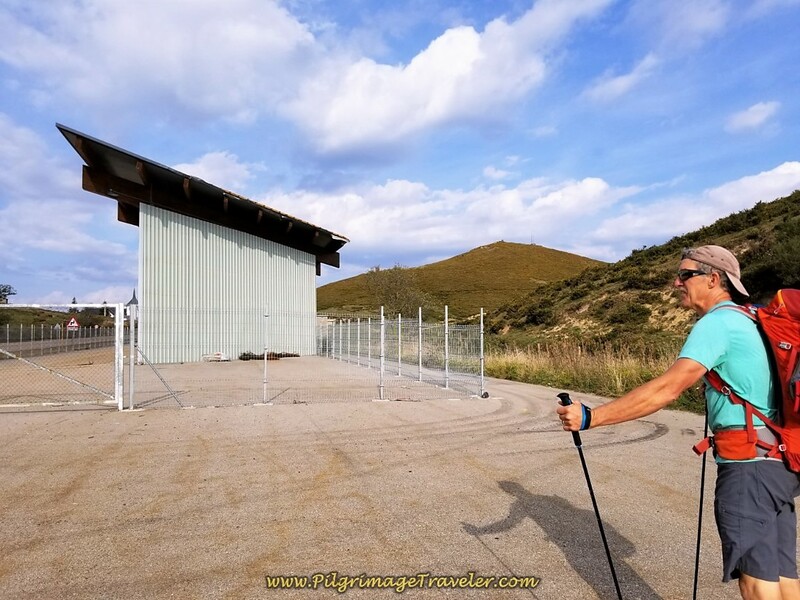 Here I am at the gate to Asturias! As you look down on the other side from the gate, the next section's vicissitudes become apparent! The way down the Puerto de Pajares is steep! I can't imagine doing this if it were rainy and muddy, or if it was filled with snow. Take your time here! 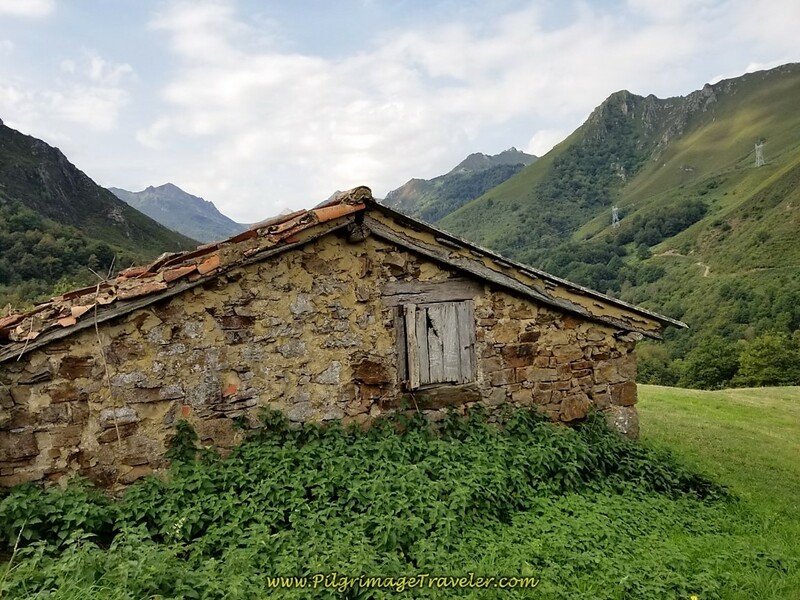 What an incredible introduction to Asturias! Initially there is a bit of a goat track, that then disperses, and you just have to chose a line and pick your way down the slope. In retrospect, we stayed too far to the right, to try to lessen the grade, however, we ended up having to cross a difficult ditch and fence line at the bottom. If you can stay more to the left of the slope, it will be steeper, but perhaps the easier way to go. There is a runaway truck ramp at the bottom of the slope - disconcerting at best! At about 10 kilometers, you cross the N-630 at the bottom of the slope where it comes down from the Parador. Here is a close-up of the runaway truck ramp at the bottom, a bit farther downhill from where we should have ended. 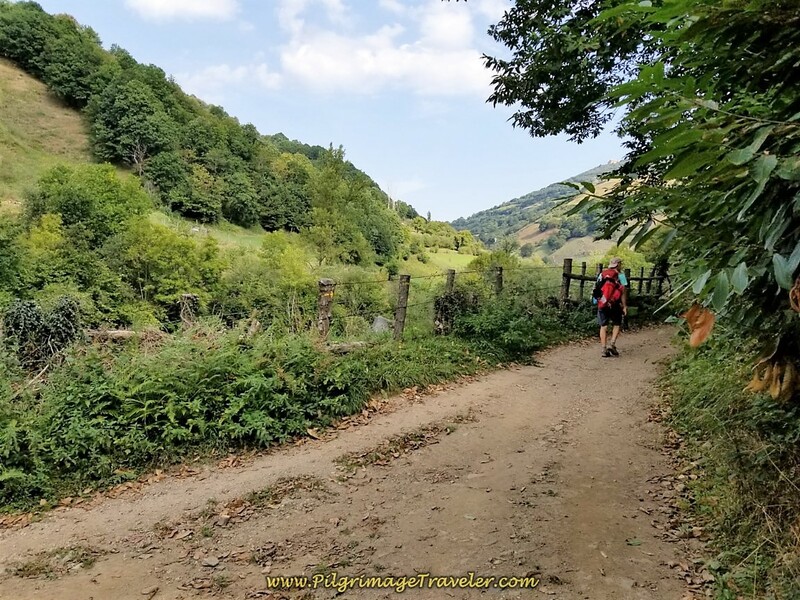 We were already exhausted at only 10 kilometers into our day three on the Camino del Salvador! 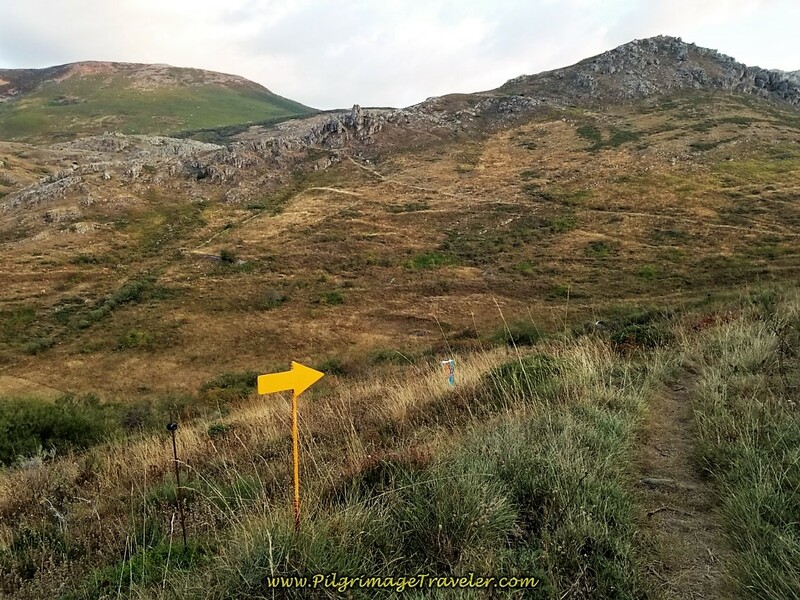 Look for the waymarks and signs across the N-630 and aim for them as you descend the slope. 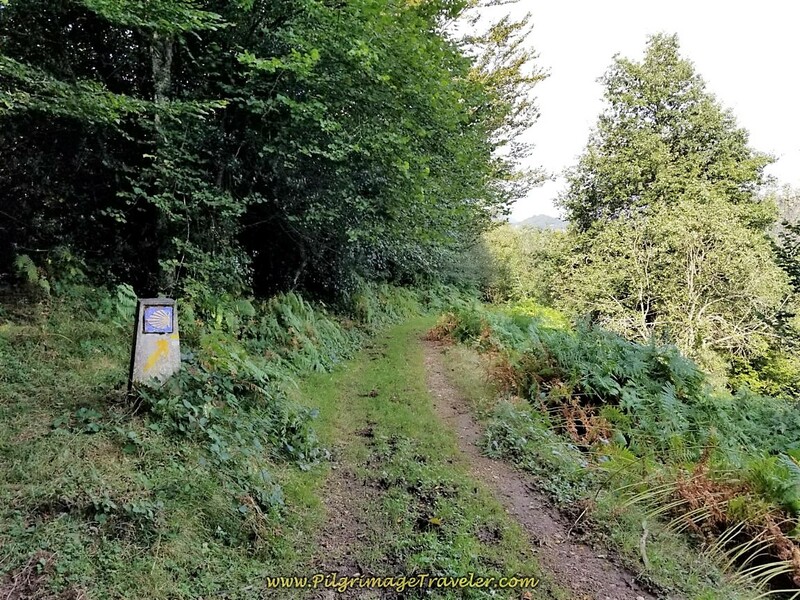 At the bottom, cross the N-630 towards an obvious path and this Asturian information board. After the information board, the path ahead affords spectacular views! Just beyond the highway, at 10.4 kilometers. the pilgrimage traveler comes to a very important decision point. Here is where you have the choice to head for the albergue in Pajares or continue onward to San Miguel del Río. 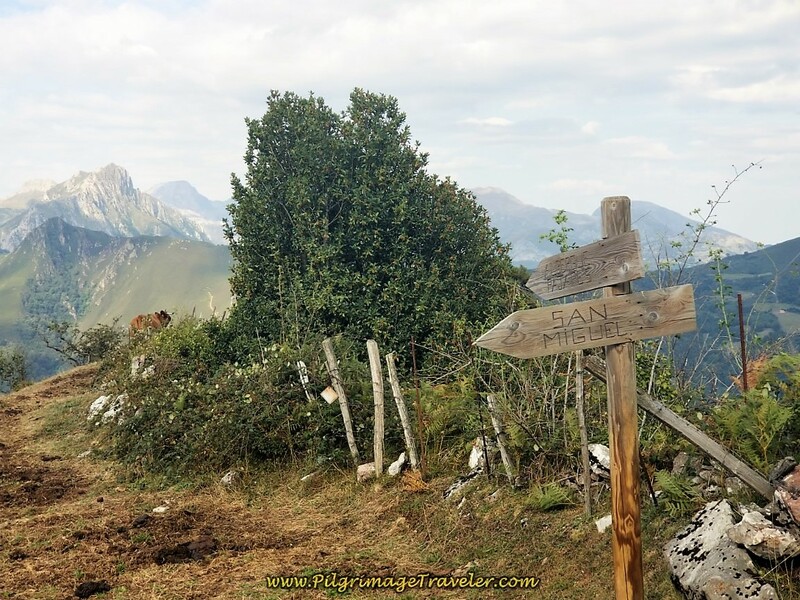 On the top of the ridge, just before a concrete waymark and a sharp bend in the track, is a wooden signpost with "Albergue" on the top arrow and "San Miguel" on the bottom arrow. A kind farmer, tending his cows was kind enough to explain the waymarking to us. 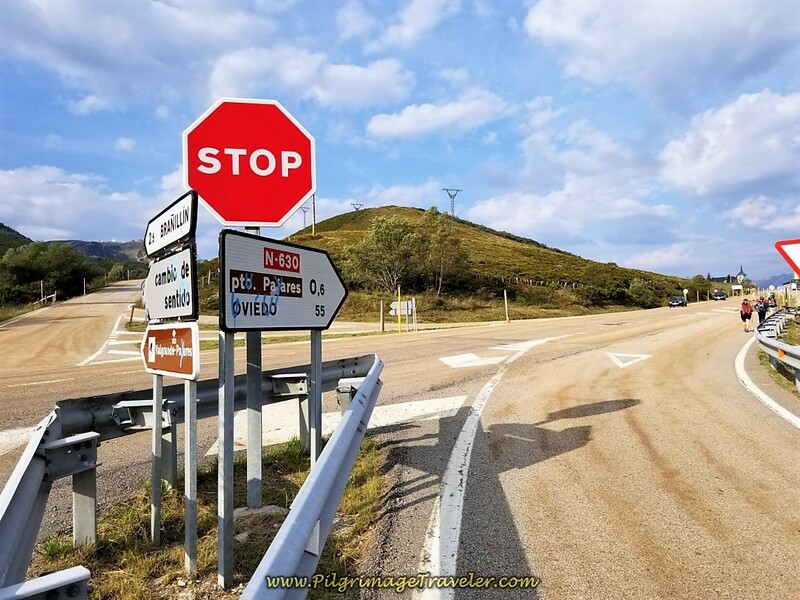 This sign post is a must find, if your destination is the albergue in Pajares. I can see how it might be easy to miss. 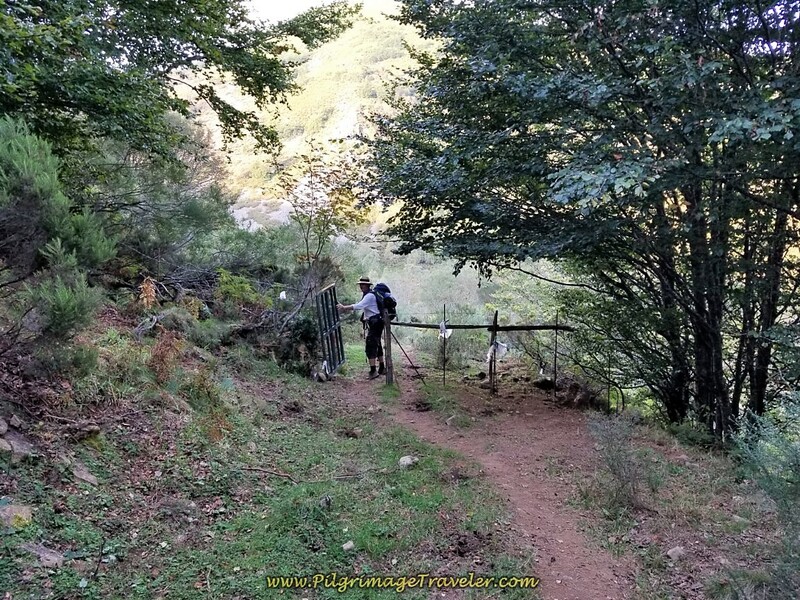 It is another 3.7 kilometers to Pajares from this decision point, for a total of 14.1 for day three, on a steep downhill that is reported to be very muddy during or after rain and a bit hard to find your way. 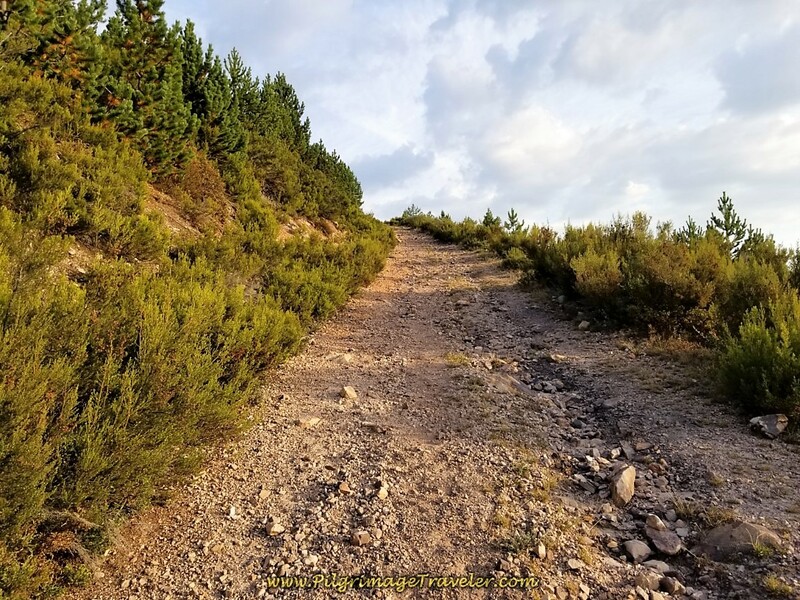 It is 4.87 kilometers from here to San Miguel del Río or a full additional 20 km (12.43 miles) to Campomanes (a total of 30.4 km or 18.89 miles from Poladura to San Miguel). 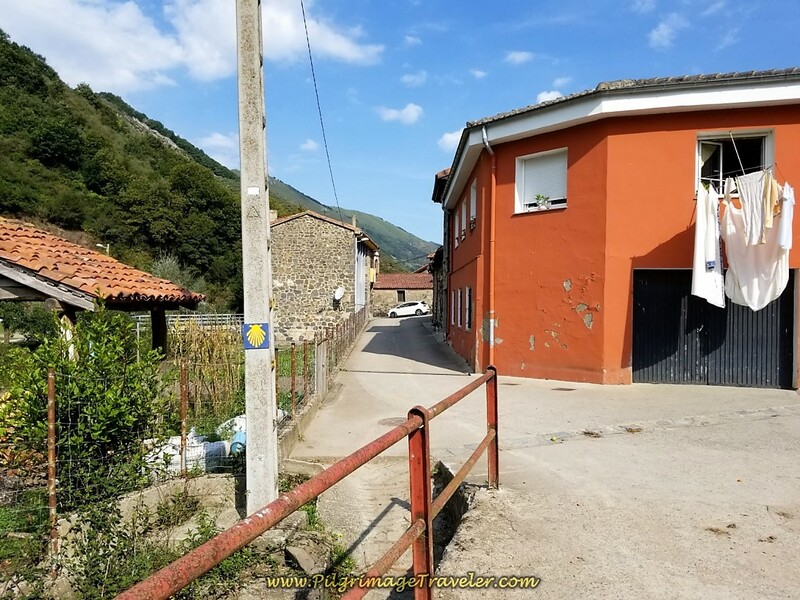 If you plan to continue on to the albergue in Bendueños, (+34 674 67 17 06), the owners will come pick you up in Herías (or Erías) right along the Camino, because the albergue is an additional 1.5 km off-Camino. 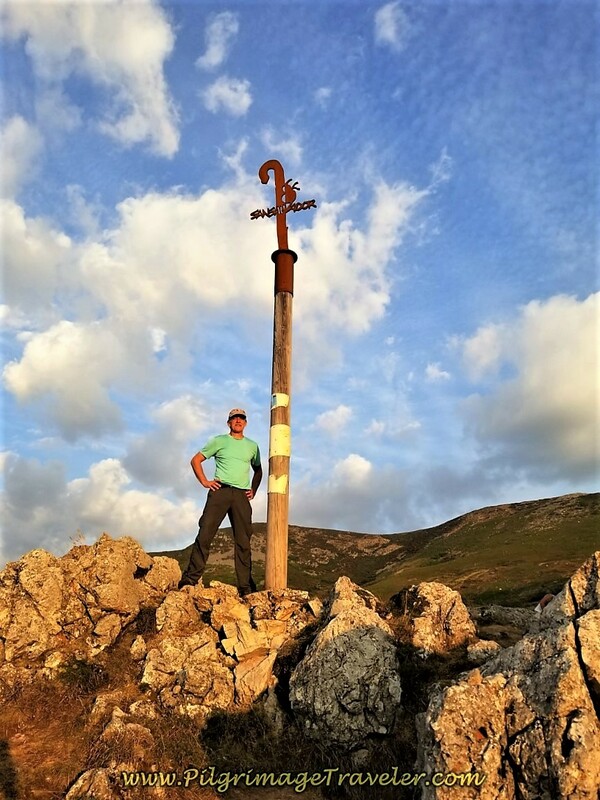 Herías is 1.59 kilometers shorter, than Campomanes at a total of 28.81 km (17.9 miles) for the day, or 18.41 (11.44 miles) more kilometers from the decision point! Make your decision here very wisely! In retrospect, as a 60 year-old woman and of relatively above average fitness for my age, I wish I had chosen to go to Pajares! The brutal downhill from here, for 20 kilometers truly did me in! The final 20 kilometers took so much longer than we expected, another full 5.0 hours, as it was all downhill as noted, and the trails are not well-maintained, as you will see on day four. 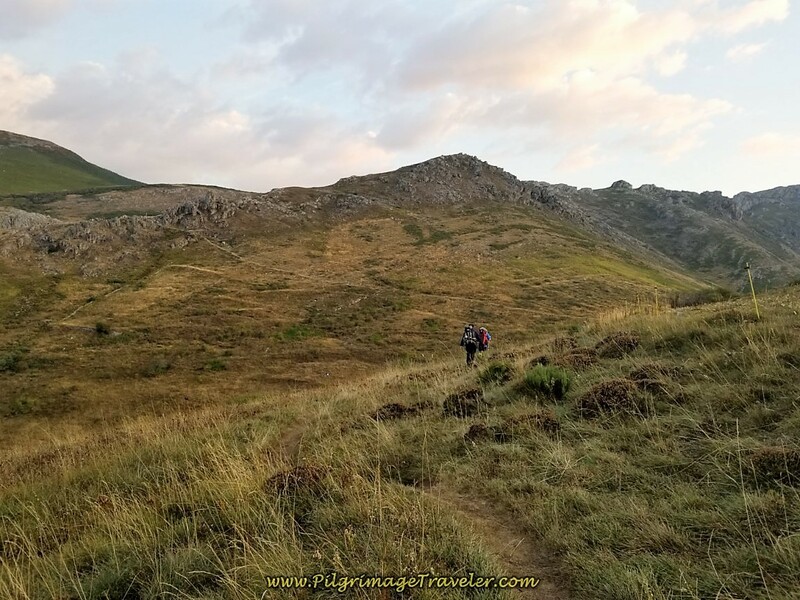 It was a full 10 hours on our day three on the Camino del Salvador, an exhausting one that I would never, ever again chose to repeat. I have no photos of this section, as we did not walk it. I will give you a brief description, based on the routes of others. I have drawn the route into our Google map above as best I could, using the GPS tracks of several others from Wikiloc. Everyone seems to have walked a slightly different path! My directions are as follows, using predominantly Google Earth, supplemented with descriptions of several other peregrinos in their blogs. Turn right and follow this road for about 1.1 kilometer. Just before this road joins the N-630, you turn left onto a path for about 560 meters. Next, join another wide dirt track that turns to pavement in about 1/2 kilometer, as it approaches Pajares. Come to a T-intersection and turn left. 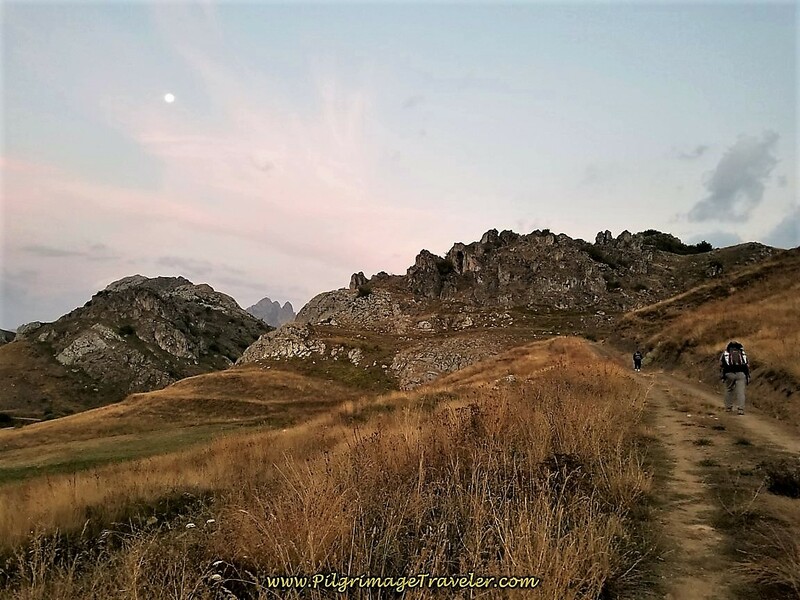 Walk into town on the side road, and to the Albergue de Peregrinos de Pajares in about 400 meters, on your left. It has eleven places and a kitchen. There is no grocery store here, so you either must bring your own food or eat in one of the local cafés. There is also the affordable Posada Real Pajares for those who prefer inns, and the Pensión El Mirador (+34 636 93 30 69). 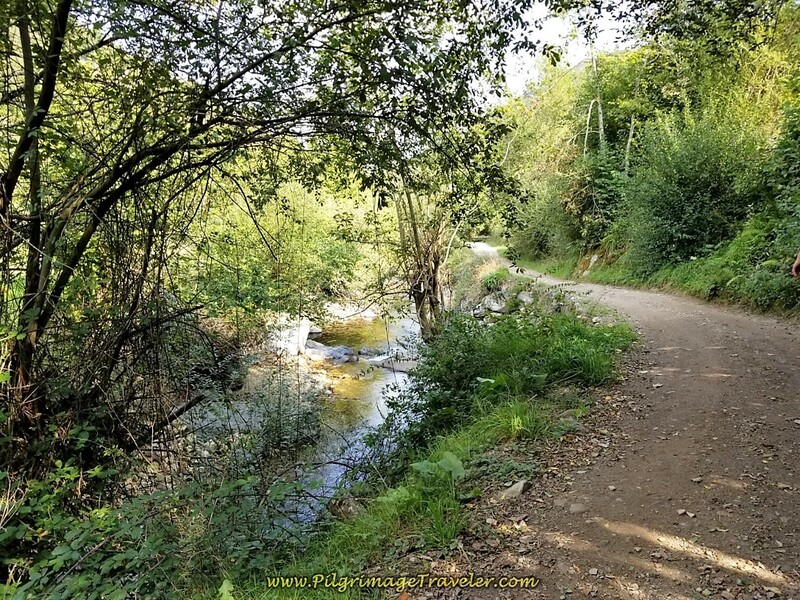 For lovely photos of Pajares itself, I found this website to be the best, the Camino de Santiago from Asturias. Be sure to use a Spanish translator. 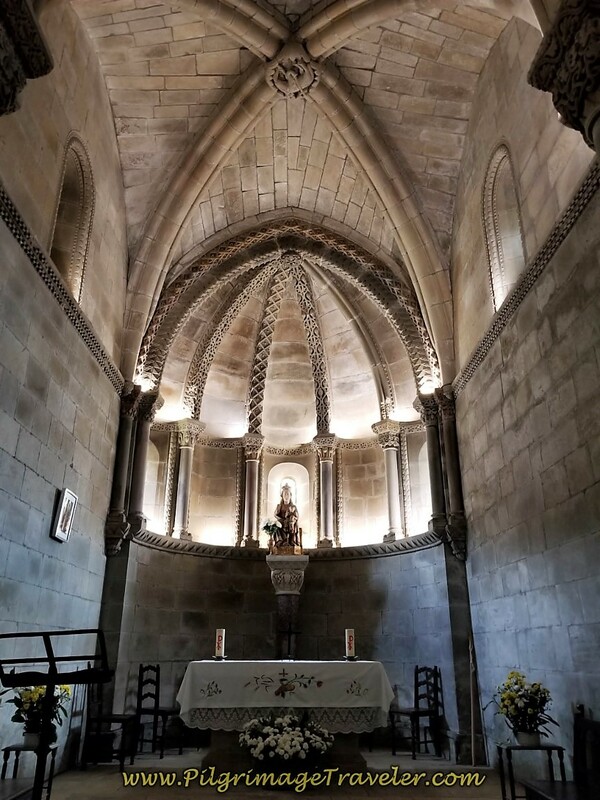 There is a ruin of an old hospital for pilgrims, called the "Solar del Hospital de San Miguel" that served pilgrims in the 18th and 19 centuries. 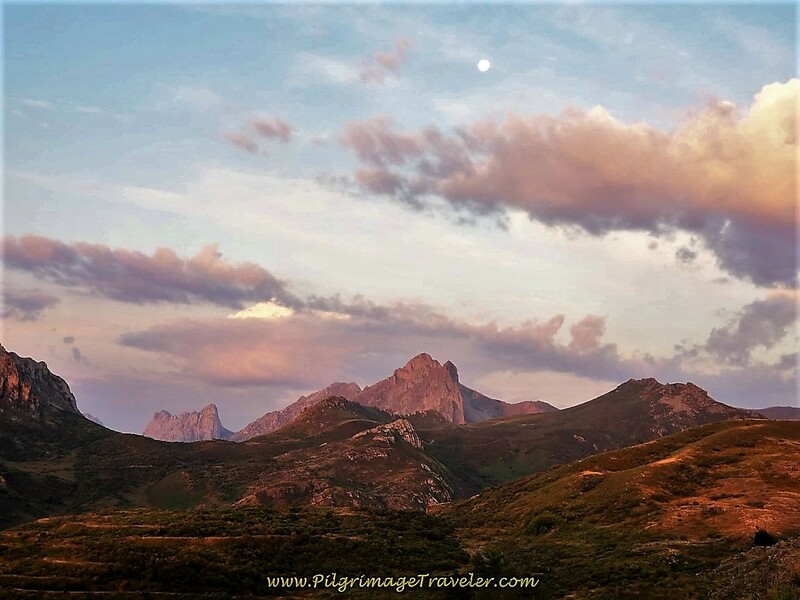 There is an old church as well and fabulous views of the mountains. As stated above, it is 4.87 kilometers from the decision point to San Miguel. It is mostly though meadows and lovely beech forests, continuing to follow the power line. 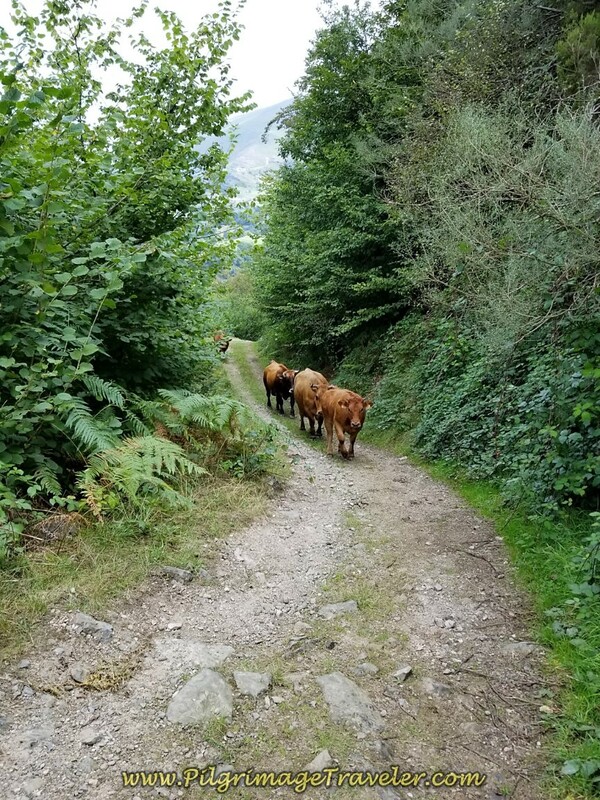 There is only an occasional waymark, but the farmers and cows use this trail, so it was easy to stay on the tractor lanes. 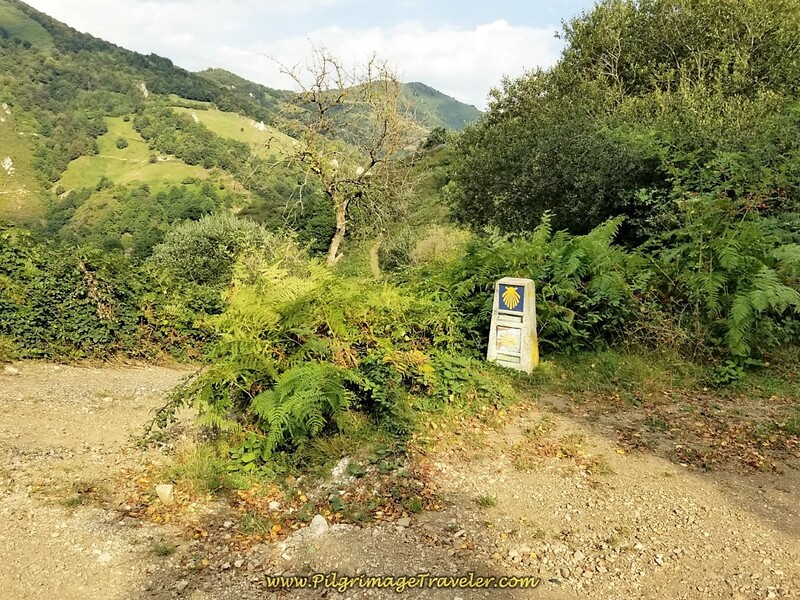 At 12.25 kilometers into day three on the Camino del Salvador, come to a prominent crossroad, with a concrete waymark directing you straight on. 12.75 kilometers a few meters after the crossroad there is a fountain. The water is potable, cold and fresh! The downhill was brutal on the legs and knees, and we made for slow time through here! I would pause and rest and try to baby my left knee that was starting to ache! 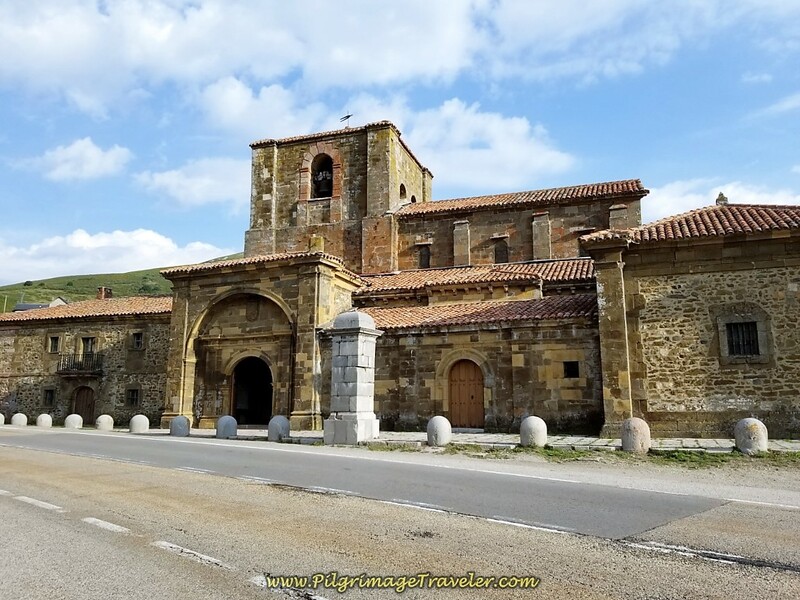 13.25 kilometers come to a cluster of these two beautiful stone buildings, with more Camino waymarks. We were happy to see this as it had been awhile since we had seen a waymark and we were questioning ourselves and our route-finding. We didn't know if we had taken the correct direction at the prior intersection, but we had. After these buildings, the Camino takes a strong bend to the right and north, and toward San Miguel. It is always such a relief to know that you are on the right path. 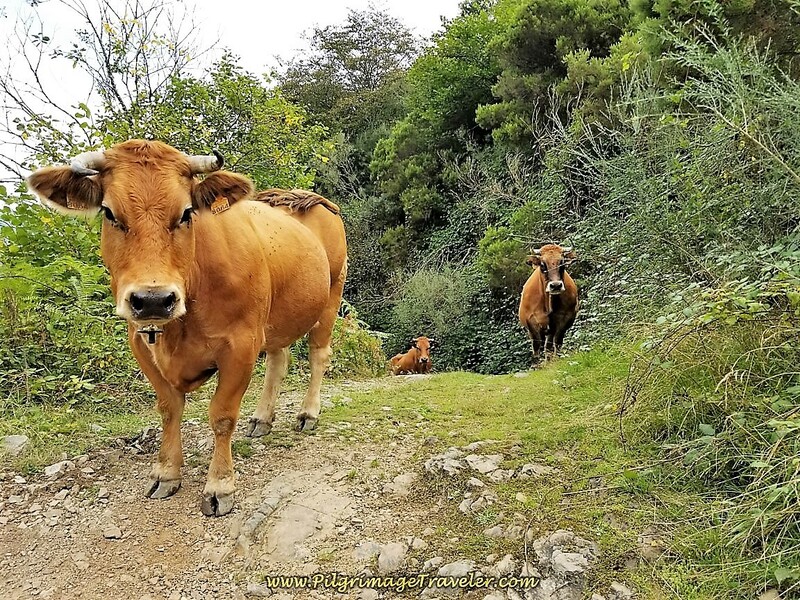 As we were descending down the next steep grade, along came the cows! They were being driven up the road by a farmer below. As cows do, they just stopped and stared at us! In about 1/2 kilometer after the buildings and the big bend, and after passing a bench to rest (which we didn't), we took a left hand turn that followed the Valgrande River valley. In about another 1/2 kilometer, another left onto this road below, and the Way finally began to level off! This blessedly flat road follows the Río Valgrande towards San Miguel at last. At 15.27 kilometers come to the town of San Miguel del Río. This is where we finally took our long lunch break. It was 12:30 in the afternoon, and we were only halfway into our day. It took us 4.5 hours to reach this point, having started at 8:00 in the morning. Come to the main square in town, marked by the church. Across from the church are wonderful shady trees with benches, right beside the river, where we sat for our picnic lunch. There is a fountain here to fill your water bottles. There are no bars in San Miguel. 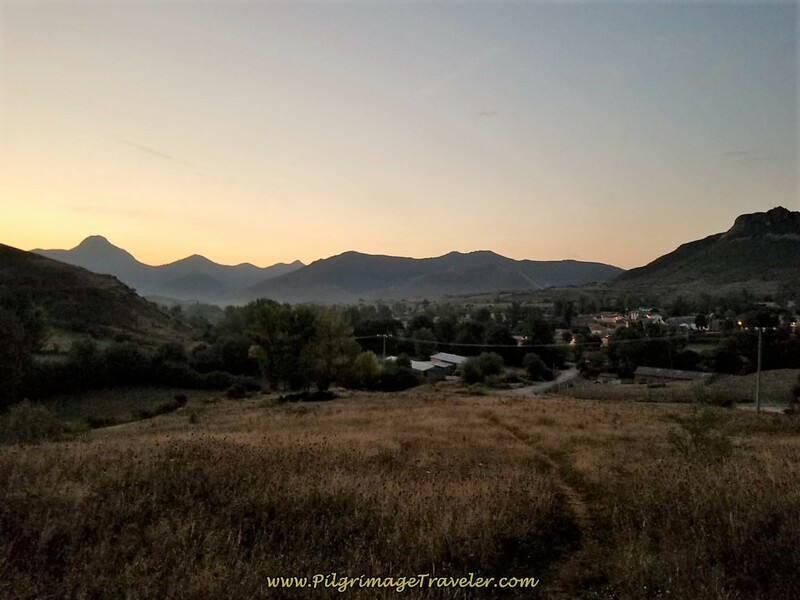 You can stay in San Miguel, but it has only very expensive rural homes, geared for the tourists going to the ski resort. They are the Casa Guela, La Cuadrina de Anton and the Casa Neno. The Casa Neno is the least expensive, and it will take a reservation for one night. The other two may not. I suppose you could also take a taxi from San Miguel to Pajares, or Campomanes, if you asked in town how to call for one! Then the taxi could return you to San Miguel in the morning. 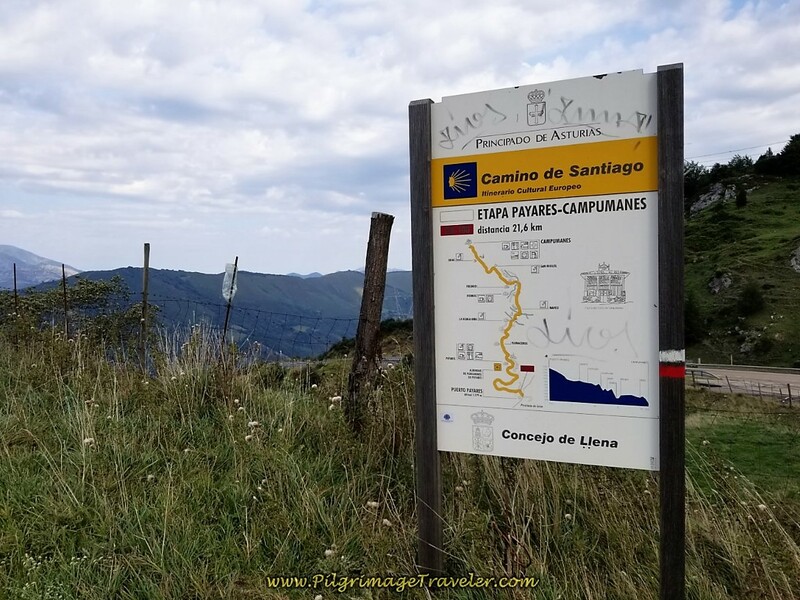 The other option would be to climb the steep road from San Miguel to Pajares, of 1.65 kilometers and an elevation gain of 260 meters (850 feet). Not a very attractive option after the elevation loss you have just accomplished. 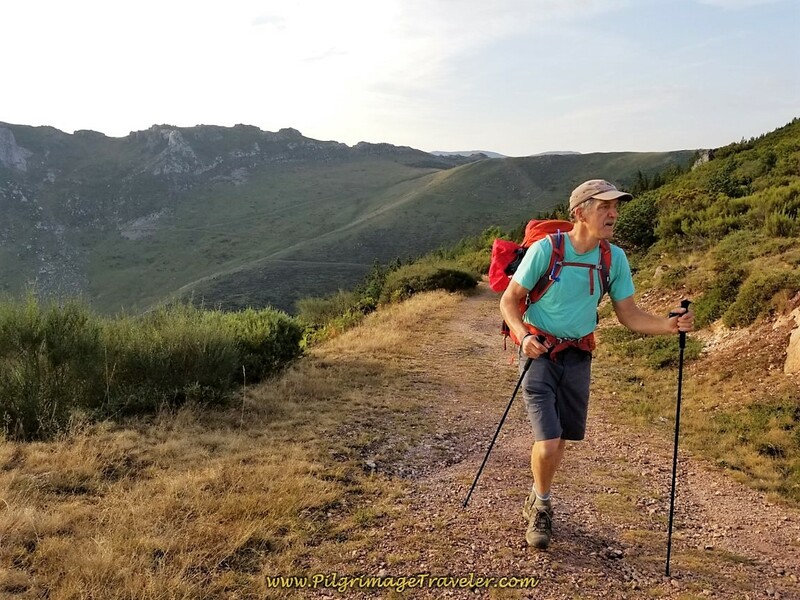 While I am only describing the first half of our day three on the Camino del Salvador, all in all I can say that while I was tired throughout the day, I did not complain too much. I was worried about my left knee, with good reason. I am not sure why we didn't stop halfway in Pajares. I thought perhaps the long lunch break in San Miguel would revive me, I suppose. And it did! But not for long enough as I was to find out. Perhaps also, I was comparing other Caminos and thinking I had done 30 km plus for many a day, with no ill effect. The rest of the day was brutal on my body, and I should have known better. Rich seemed to be doing just fine, and he was very patient with me, going forward. Bless him! Or maybe, I had finally found my limit. Or maybe I didn't see very well from each new vista. I will never know for sure. 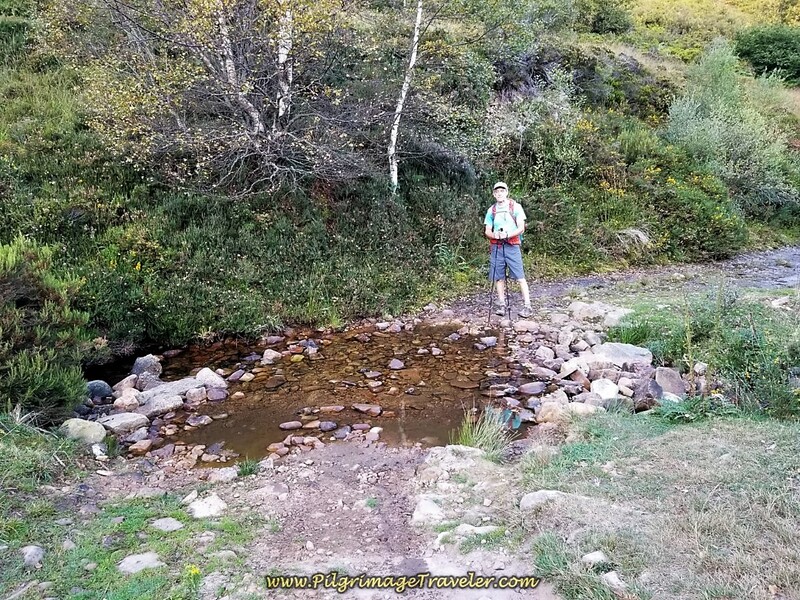 Unless you are accustomed to long up/downhill stints through difficult trails, and are truly a hardy soul, you may want to consider breaking up this day. Enjoy the views in the mountains. They are special indeed. Take your time and go slowly. 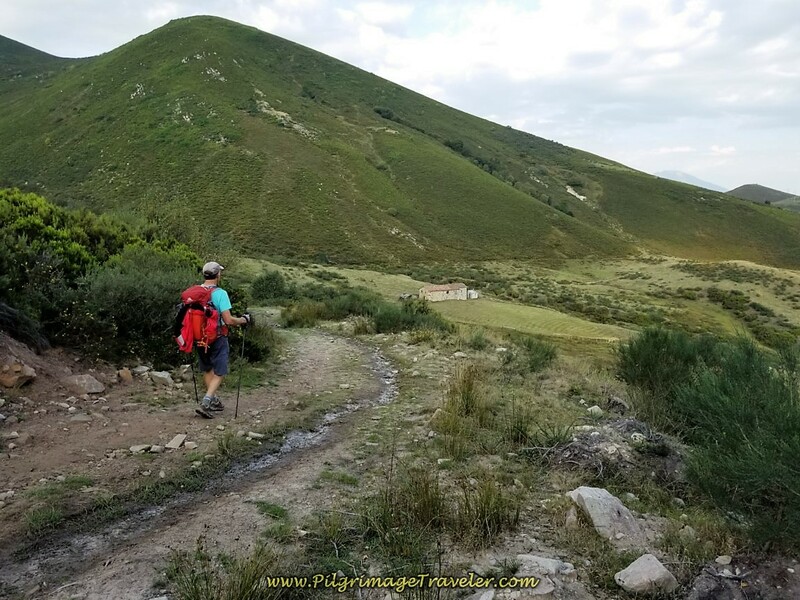 May you have no regrets on your own day three of the Camino de San Salvador. May each new summit afford a new scene from a new vantage point. May your own goals not overshadow your judgement and may you listen to your body so you can continue to climb steadily, slowly and enjoying each passing moment! Ultreia!